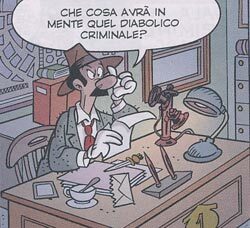 The character of Fantomallard, created by Italian writer Guido Martina, is mentioned in several Italian stories: PAPERINIK IL DIABOLICO VENDICATORE TOP. 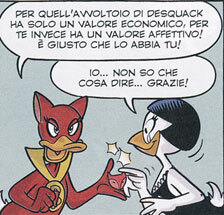 n�6-707 (THE DIABOLICAL DUCK AVENGER), PAPERINIK ALLA RISCOSSA TOP. 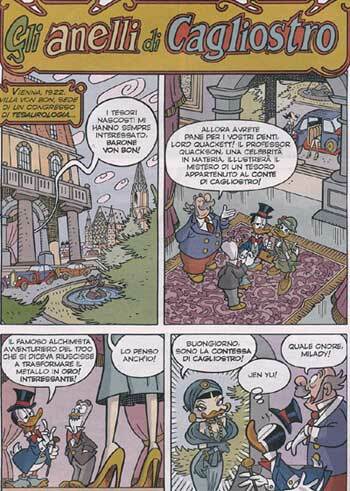 n�3-744 (THE REVENGE OF DUCK AVENGER), PAPERINIK E IL RITORNO A VILLA ROSA TOP. 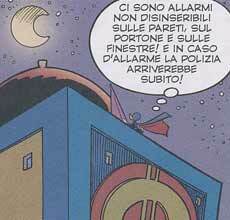 n�29-2130 (DUCK AVENGER AND THE RETURN TO VILLA ROSE), PAPERINIK CONTRO LE GIOVANI MARMOTTE TOP. 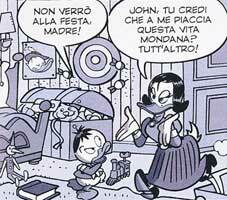 n�98 (DUCK AVENGER AGAINST THE JUNIOR WOODCHUCKS), PAPERINIK E L'ESTATE A VILLA LALLA TOP. 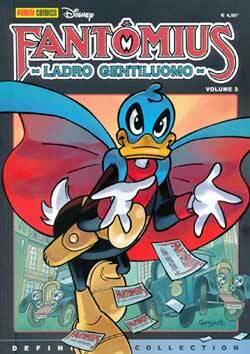 n�37 (DUCK AVENGER AND THE SUMMER AT VILLA LALLA), PAPERINIK E L'OMBRA DI FANTOMIUS TOP. 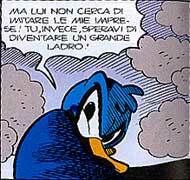 n�55 (DUCK AVENGER AND THE FANTOMALLARD's SHADOW), PAPERINIK E L'OLTRAGGIO CINEMATOGRAFICO TOP n�84 (DUCK AVENGER AND THE CINEMA OFFENCE) and in the saga of the ULTRAHEROES TOP. 2726-2734. 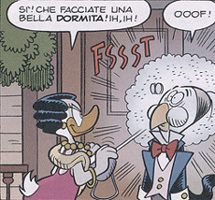 His image appears (drawn by Romano Scarpa and Giorgio Cavazzano) together with his fiancee Dolly Paprika, in the second adventure where FANTOMALLARD was impersonated both by Donald and Gladstone, and in this "misterious" story the costume of Dolly Paprika is worn by Daisy . In the adventure DUCK AVENGER AND THE FANTOMALLARD's SHADOW the autor Gervasio let the worthless thief Bob Paperhide impersonate the misterious gentleman burglar. 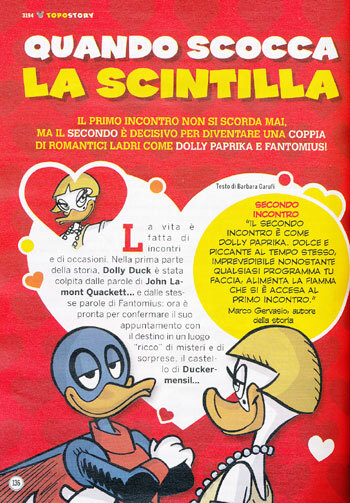 In the story PAPERINIK E IL TESORO DI DOLLY PAPRIKA TOP n� 2675 (DUCK AVENGER AND THE TREASURE OF DOLLY PAPRIKA) the real characters of FANTOMALLARD and Dolly Paprika are shown in some flash back images. 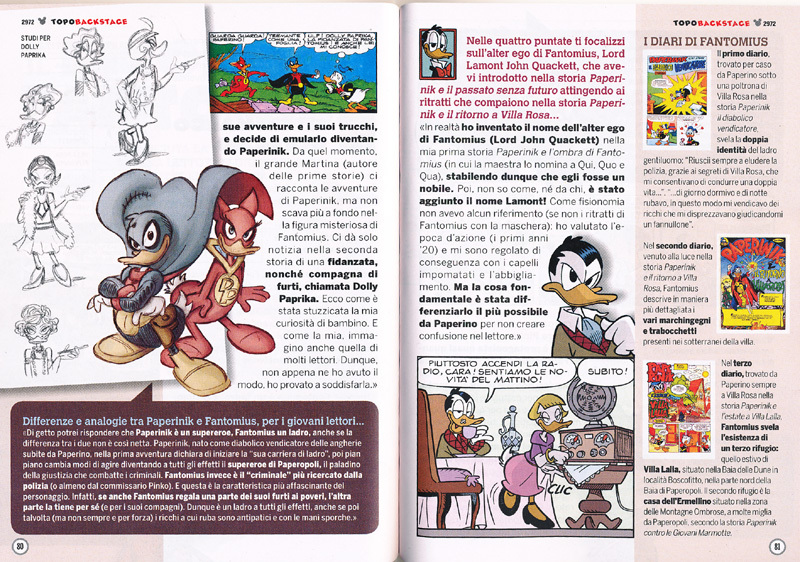 The real characters of FANTOMALLARD and Dolly Paprika are shown again in the other Gervasio's stories PAPERINIK E IL SEGRETO DI FANTOMIUS TOP n� 2902 (DUCK AVENGER AND THE SECRET OF FANTOMALLARD), PAPERINIK E IL PASSATO SENZA FUTURO TOP. 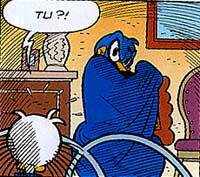 n�33 (DUCK AVENGER AND THE PAST WITHOUT FUTURE). 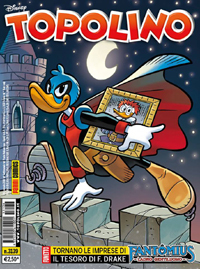 Donald pretends to be the ghost of FANTOMALLARD in the story of Salati and Mazzon PAPERINIK E L'ALTRO PAPERINO TOP n� 2950 (DUCK AVENGER AND THE OTHER DONALD), Donald pretends again to be FANTOMALLARD in the story PAPERINIK E IL RITORNO DI LÈBRICCONS TOP. n�67 (DUCK AVENGER AND THE RETURN OF LÈBRICCONS). 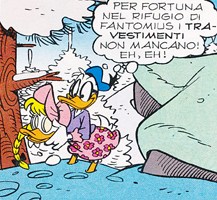 FANTOMALLARD and Dolly Paprika are also shown in a couple of frame in the third part of the story PAPERINIK SULL'OCEANO SCOMBINATO TOP. n� 3008 (DUCK AVENGER ON THE CHAOTIC OCEAN). 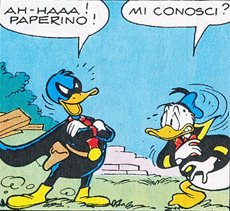 Gladstone and Donald pretend again to be FANTOMALLARD in the story PAPERINIK COLPISCE ANCORA (DUCK AVENGER STRIKES AGAIN TOP. n�77. 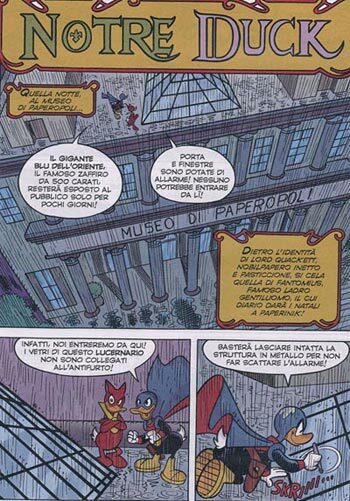 FANTOMALLARD is many times mentioned in the story with different ending PAPERINIK IN...I DESTINI DI UN EROE (DUCK AVENGER IN...THE DESTINY OF A HERO) TOP. n�48. FANTOMALLARD and Dolly Paprika are also shown in the 1929 in some frames of the story by Enna and De Lorenzi LA GRANDE CORSA-NEL PASSATO (THE BIG RACE-INTO THE PAST) TOP. n� 3111. 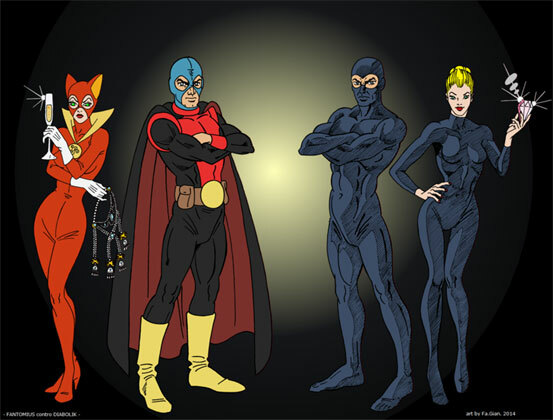 FANTOMALLARD is also the protagonist of the saga created by Marco Gervasio titled LE STRABILIANTI IMPRESE DI FANTOMIUS -LADRO GENTILUOMO- (THE AMAZING VENTURES OF FANTOMALLARD -GENTEMAN BURGLAR-). This saga includes the following stories: IL MONTE ROSA (THE PINK MOUNT TOP. 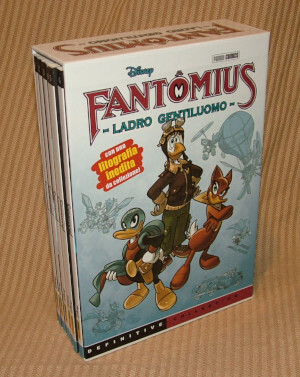 n� 2972, L'EVASIONE DI FANTOMIUS (THE FANTOMALLARD ESCAPE) TOP. n� 2973, FANTOMIUS A BORDO (FANTOMALLARD ON BOARD) TOP. n� 2974, BRUTFAGOR (BRUTFAGOR) TOP. n� 2975, SILENZIO IN SALA (SILENCE IN THE MOVIE THEATER) TOP. n� 2994, LA MALEDIZIONE DEL FARAONE (CURSE OF THE PHARAOH) TOP. n� 3036, L' OTTAVA MERAVIGLIA DEL MONDO (THE EIGHTH WONDER OF THE WORLD) TOP. n� 3037, FANTOMIUS SULLA NEVE (FANTOMALLARD ON THE SNOW) TOP. n� 3039, LA MASCHERA DI FU MAN ETCHÙ (THE MASK OF FU MAN ETCHÙ) TOP. n� 3072, IL BOTTINO DEI BARKSERVILLE (THE BOOTY OF THE BARKSERVILLE) TOP. n� 3073, IL TESORO DEL DOGE (THE DOGE'S TREASURE) TOP. n� 3075, IL NOBILE DIETRO LA MASCHERA (THE NOBLE BEHIND THE MASK) TOP. n� 3107, GLI ANELLI DI CAGLIOSTRO (THE CAGLIOSTRO'S RINGS) TOP. n� 3108, IL TESORO DI FRANCIS DRAKE (THE TREASURE OF FRANCIS DRAKE) TOP. n� 3139, FANTOMIUS D'EGITTO (FANTOMALLARD OF EGYPT) TOP. n� 3142, IL LADRO E IL MILIARDARIO (THE THIEF AND THE BILIONARE) TOP. n� 3145, DOLLY PAPRIKA TOP. n� 3194, NOTRE DUCK TOP. n� 3210, SENZA MASCHERA (WITHOUT MASK) TOP. 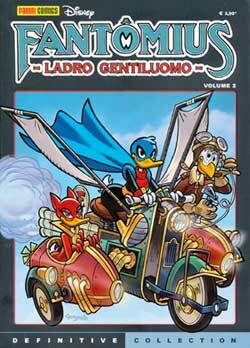 n� 3225, LA SFIDA DI FANTOMIUS (THE CHALLENGE OF FANTOMALLARD) TOP. n� 3237, LA NOTTE DELLE GEMME (THE NIGHT OF THE GEMES) TOP. 3273, I DUE VENDICATORI (THE TWO AVENGERS) TOP. 3275, LA SETTIMA ARTE (THE SEVENTH ART) TOP. 3280. In the Danish stories THE LEGACY (story code D/ D 2003-017), HOT CHEMISTRY (story code D 2003-291), ONCE UPON A TIME ...URGH! (story code D 2004-303), SOUND AND FURY (story code D D 2005-062) and MISTAKEN IDENTITY (story code D 2005-124) an unusual modern version of FANTOMALLARD (PK style) is also shown. It is told in the first Duck Avenger story that Fantomallard was a gentleman thief who robbed only from the rich ("Pretty smart!" said Donald "what could he gain from robbing the poor?"). In his diary, casually found by Donald in the false-bottom of a big armchair in Villa Rose Fantomallard describes his double identity: "I was able to escape from the police because of Villa Rose's secrets, which allow me to conduce a double life..."
"...I slept during the day and robbed at night. This way I had my revenge against the high society people who despised me and considered me good for nothing." Other than Villa Rose, Fantomallard described his "mobile tank" equipped with special devices in his diary . "I Fantomallard, called the elusive, write this memo so that those who come after me will know the truth about me, better if someone, in my same condition, will be able to imitate my deeds. To this future unknown heir I dedicate my diary wishing good luck". 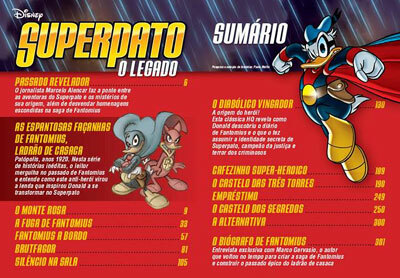 In the story DUCK AVENGER AND THE SECRET OF FANTOMALLARD the last page of the Fantomallard's diary is shown. In this page it is said: " Thanks to my dear friend Copernicus, whitout him all that is told in this diary would have not been possible ! ". 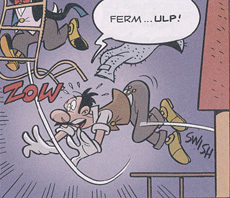 In this sentence Fantomallard makes reference to his friend Copernicus Gearloose (Great grandfather of Gyro Gearloose) inventor of the famous special devices used by Fantomallard. 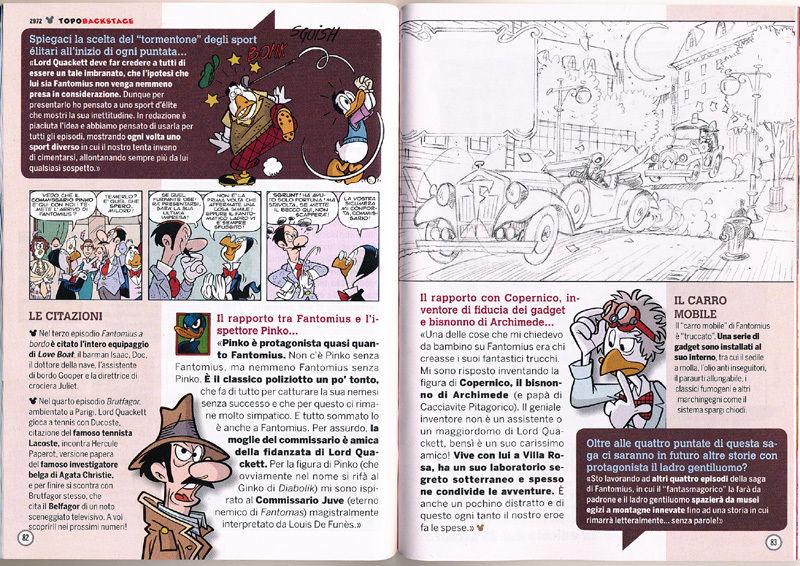 In the story PAPERINIK E IL PASSATO SENZA FUTURO (DUCK AVENGER AND THE PAST WITHOUT FUTURE) Marco Gervasio let us know other part of the Fantomallard's secret diary. These parts are related to his first encounter with Dolly Paprika: "The party in the mansion of the countess Mc Snob was at the pick! But for Dolly so lovely with her purple dress it was just another boring night...My future fiance and accomplice was smart enough to face the arrogant conversations...and she knew how to avoid them ! But Dolly she was not awared to meet me!" 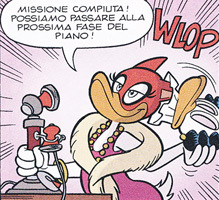 Than Fantomallard conclude the description of his first del primo encounter with Dolly Paprika with these words: "That night Dolly not only she did't call the police but she decide to follow me in my adventures and robbery ! Furthermore she also suggest me to write my memories and my secrets on this diary to hand down to posterity!" 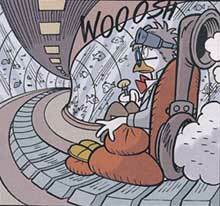 In a second diary found by Donald in the story DUCK AVENGER AND THE RETURN TO VILLA ROSE, the tricks and machineries located in Villa Rose's secret underground are better described. If we suppose the story plays in the middle 50s, 100 years earlier would have places the death of Fantomallard in the second half of the 1800s, still a "Far West" period in the California state. To place such a classy villain (with special devices and a mobile car) in that period is not credible. 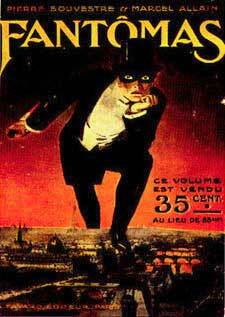 It Is much more reasonable to consider Fantomallard a typical gentleman thief of the first decades of the twentieth century ("belle epoque" prohibitionist period) for sure years that fit pretty well to a tenebrous and misterious outlaw. 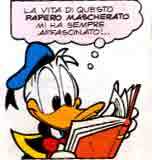 In the story DUCK AVENGER AGAINST THE JUNIOR WOODCHUCKS an old book found by Donald in the public library is shown. In this book some of Fantomallard missions and even some of his secret refuges such as Villa Rose and the Ermine's house, which is located in the shadowy mountains some miles out of Duckburg city limit, are described. 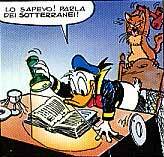 In a third diary also found in Villa Rose's underground in the story DUCK AVENGER AND THE SUMMER AT VILLA LALLA, Donald discovers another Fantomallard's secret mansion, the summer refuge of Villa Lalla located in the Dune Bay, Dark Forest locality in the north area of Duckburg bay. 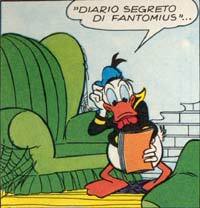 Very likely the same diary is used by Donald in the story PAPERINIK COLPISCE ANCORA (DUCK AVENGER STRIKES AGAIN) to explore another secret hideout belonged to Fantomallard the Dismal Valley Manor, a creepy fake-medieval castle located outside Duckburg. 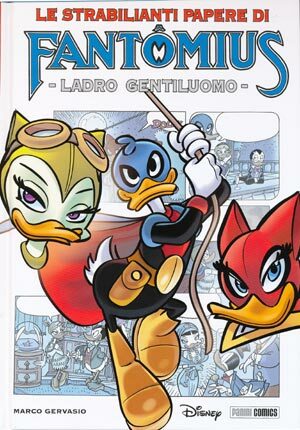 In the story LE STRABILIANTI IMPRESE DI FANTOMIUS- LADRO GENTILUOMO- I DUE VENDICATORI (THE AMAZING VENTURES OF FANTOMALLARD- GENTLEMAN THIEF- THE TWO AVENGERS) Marco Gervasio shows that also Duck Avenger has a secret diary of his history. For a sort or "dark romantic attitude" he sometime update this diary in the secret hideout of the Villa Rose remains. About the Fantomallard's "mobile tank" we know for sure that it was equipped with the devices shown in the first Duck Avenger story (THE DIABOLICAL DUCK AVENGER), and installed by Gyro in Donald's car according to the indications of the Fantomallard's diary: spring ejected seat, anti-pursuer oil and extensible bumpers. 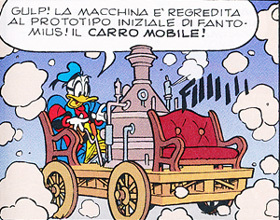 Also the smoke device was installed in the Fantomallard's special car as described in the novelized version of the first story and also shown by Marco Gervasio in his adventure DUCK AVENGER AND THE TREASURE OF DOLLY PAPRIKA. It is however reasonable that this special car was dotated with other devices such as the nails spreading system and others. For what concerns the typology of this car, the sketch shown in an illustration of the first story looks to much like a war heavy tank to be considerably reliable (it is pretty ridiculous to imagine Fantomallard was making his nightly secret mission in a war tank!). It is thus more logical to suppose the "special tank" as a modified sport car of the first decades of the twentieth century. It is indeed possible that the representation of the "mobile tank" on the Fantomallard's diary was related to an early prototype of his special car which was probably developed as a steam car at the beginning of the XXth century. 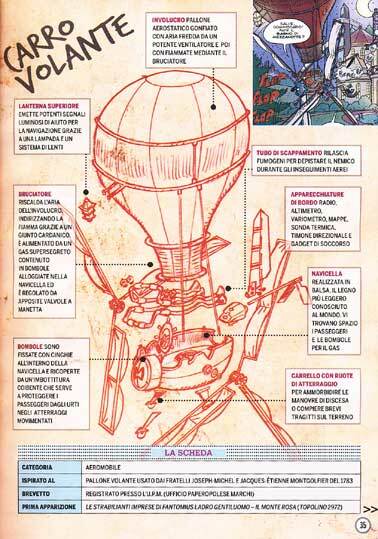 In fact a drawing of the "mobile tank" similar to the one represented in the diary is visible in the 1910 inside the laboratory of Copernicus This image is shown by Gervasio in his story related to the origin of Fantomallard titled THE AMAZING VENTURES OF FANTOMALLARD -GENTEMAN BURGLAR- THE NOBLE BEHIND THE MASK. 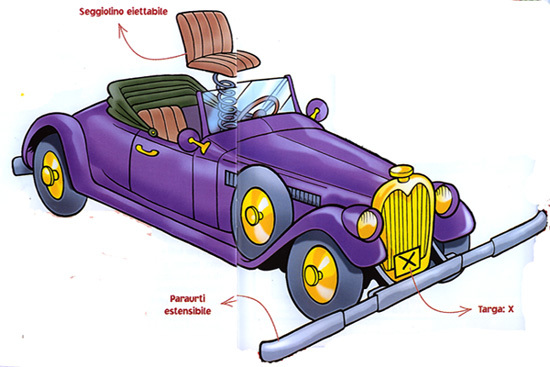 A reasonable representation of the Fantomallard's special car is shown in the story of Marco Gervasio DUCK AVENGER AND THE TREASURE OF DOLLY PAPRIKA. In this beautiful adventure there is also evidence of the Fantomallard lifetime being the story plays during the first years of the XXth century. 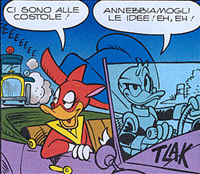 The Fantomallard's special car is again well represented in the story by Pesce and Mangiatordi DUCK AVENGER AND THE MISTERIOUS FANTOMALLARD. 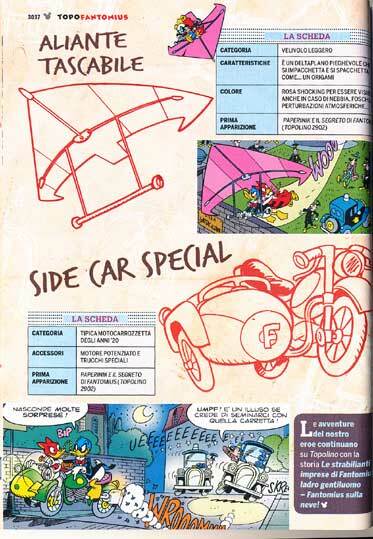 In this adventure the special car of Fantomallard is located in the Duckburg's museum of Science and Technology where it is called the "Misterious Fantomallard"
In the same story the Fantomallard's special car is again utilized by Duck Avenger against a dangerous enemy, the Analogic Raider. 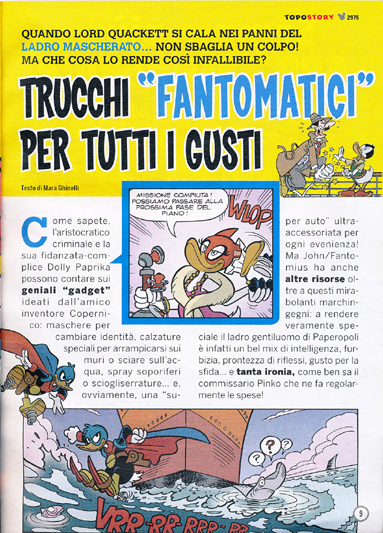 In this adventure the masked duck is also using two of the first Fantomallard's special devices: the special acid mushroom and the special acid spray. 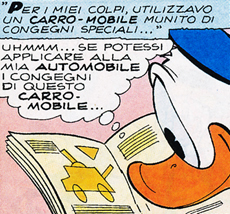 The Fantomallard's special car is again represented always in the story of Pesce e Mangiatordi DUCK AVENGER AND THE IGNOBLE ATTACK TO THE WIRELESS TELEPHONY. 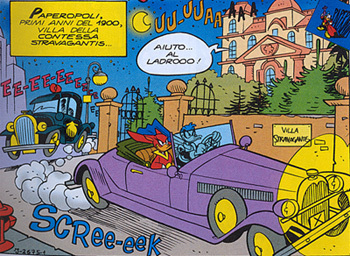 Other beautiful scenes of the Fantomallard's special car are shown by Gervasio in the story dedicated to the Phantom of Notre Duck titled THE AMAZING VENTURES OF FANTOMALLARD - GENTLEMAN BURGLAR- NOTRE DUCK. 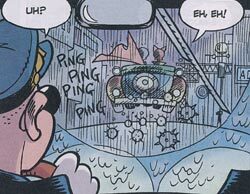 In one of the scene Fantomallard blocks the police car spreading a sort of nailed spheres released by a special mechanism of his car. 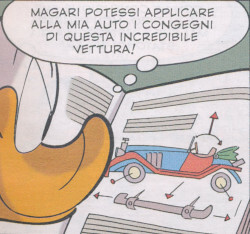 Another beautiful image of the Fantomallard's special car is present in the booklet n� 67 of the DeAGOSTINI's library dedicated to the Donald's car as well as the Duck Avenger special variant. 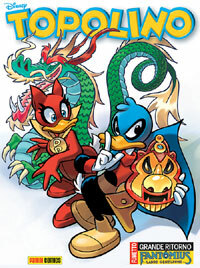 In this booklet very interesting references to the Duck Avenger origins are present. 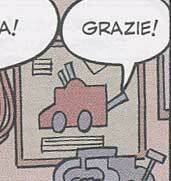 Furthermore three pages are also dedicated to the special car of Fantomallard and Dolly Paprika. This special car can be considered as an experimental model precursor of the famous Duesenberg Covertible 1929. 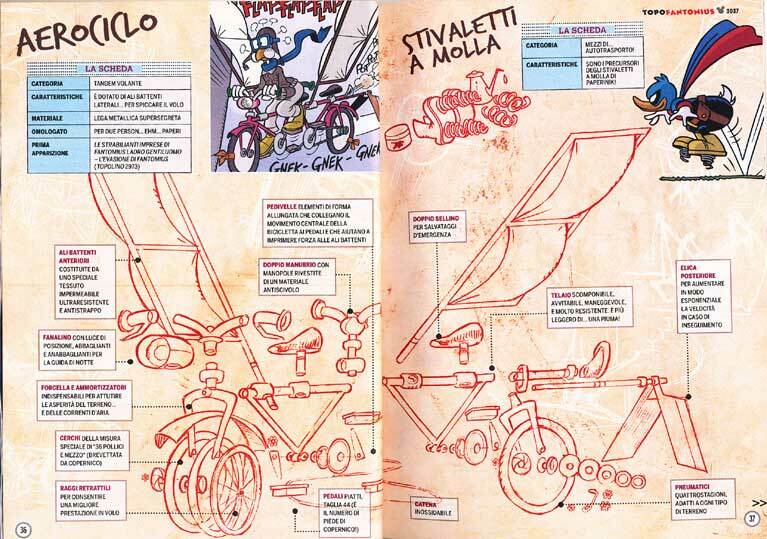 In the story DUCK AVENGER AND THE SECRET OF FANTOMALLARD Marco Gervasio makes an intersting representation of another vehicle used by Fantomallard and his girl-friend. This vehicle is a Sidecar of the first decades of the 1900 modified with some special devices like the nails spreading system and the smoke device. 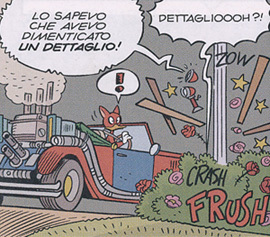 In the story THE CURSE OF THE PHARAOH Marco Gervasio shows again the Sidecar of Fantomallard and Dolly Paprika being used during their escape from the Museum of Duckburg, where the gentleman thief has just stolen a precious document hidden in a vase belonged to the Pharaoh Tutanquackmon. 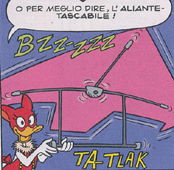 As far as the special devices utilized by Fantomallard are concerned, in the first and second adventures of Duck Avenger some of the tricks found by Donald in Villa Rose are shown. Other than the black costume incorporating the pocket progressive opening parachute and the spring boots (whose allow to jump up to 10 meters -about 30 feet-), we have the hypnotic oil lamp, the double effect candle wax/dynamite, the special acid mushroom, the special acid spray and probably the fast sleep powder and the smoke bomb. Quite a bit interesting is a drawing in the story THE REVENGE OF DUCK AVENGER where Fantomallard's personal weapon, identifiable as a Colt .45 Model 1911, is well represented. It was probably found by Donald together with the costume. Some of the items belong to Fantomallard photographed in Villa Rose. Over the black and red cloack there is a portrait of Fantomallard, the hypnotic oil lamp, the double effect candle wax/dynamite, the Colt. 45 Model 1911 and the blue mask. 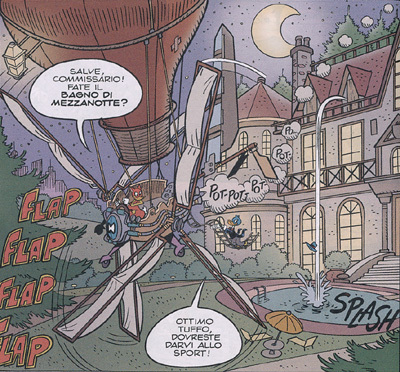 In the same story other two special devices are used by Fantomallard and Dolly Paprika for their incredible escapes: an aerostatic baloon with propulsive sails and a back pack with foldable gyro-rotors. These strange machinery brings to mind some of the strange machinery shown in the TV serial (and relevant movie) Wild Wild West. 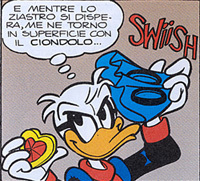 Among the various special devices used by Fantomallard and Dolly Paprika in the second story of the saga there are the famous special acid mushroom, the fast sleep gas, a night vision binoculars and a special belt buckle metal cutting. 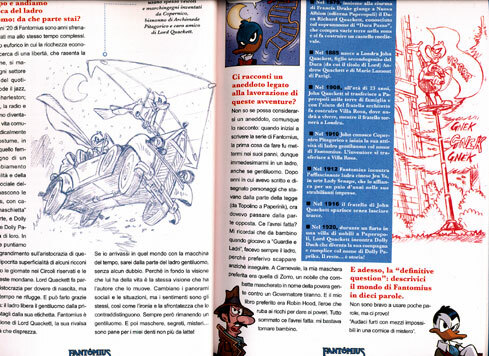 Other special devices shown in the third adventure of the saga THE AMAZING VENTURES OF FANTOMALLARD -GENTEMAN BURGLAR- titled FANTOMALLARD ON BOARD are the special suction disks and the mini water-ski with auto-propulsion. In the story THE EIGHTH WONDER OF THE WORLD Marco Gervasio shows another of the amazing machines used by Fantomallard and created by Copernicus, the Fantomarine. This submarine with a nautiloid like shape, was probably designed to discover and collect lost treasures beneath the sea. It is kept hidden in an underground cave in the Dune Bay up to north of Duckburg in the vicinity of Fantomallard' s summer house of Villa Lalla . 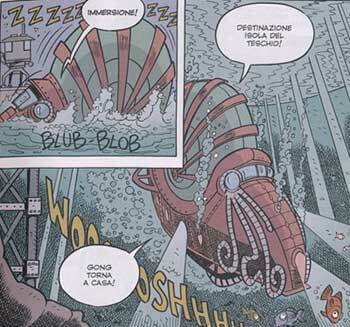 The secret cave where the Fantomarine is anchored can be reached using a long tunnel, which even if in the story for narrative simplicity and instant reference is referred to be connected with Villa Rose (Villa Rose is located in the foothills away from the coast and is exaggerated and implausible a tunnel that crosses all Duckburg) it is more logic to image the Fantomarine secret cave connected with the basement of Villa Lalla being this Villa located in proximity of the coast. Thus Villa Lalla can be logically imagined as used by the gentleman thief and his companions during the mission that require the use of their special "naval machinery". In the same story is also shown a particular steam cushion vehicle used by Copernicus to go through the underground tunnel that connects Villa Lalla with the cave in the Dune Bay where the Fantomallard's Fantomarine is anchored. In the story THE AMAZING VENTURES OF FANTOMALLARD -GENTLEMAN BURGLAR- THE DOGE'S TREASURE set in Venice Fantomallard and Dolly Paprika use a special motorized gondola created by Copernicus. This special boat can thus go out from the water canals and travel on ground. 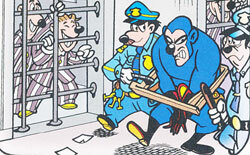 On the cover of the second volume of the comic series DEFINITIVE COLLECTION dedicated to the Fantomallard saga, the Disney artist Marco Gervasio show another of the strange machinery used by the gentleman thief and his friends. 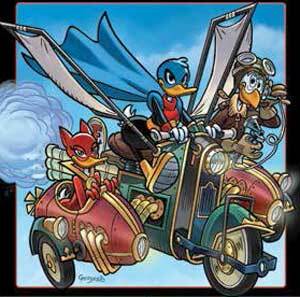 In this image Fantomallard, Dolly Paprika and Copernicus are riding a special flying bi-sidecar. 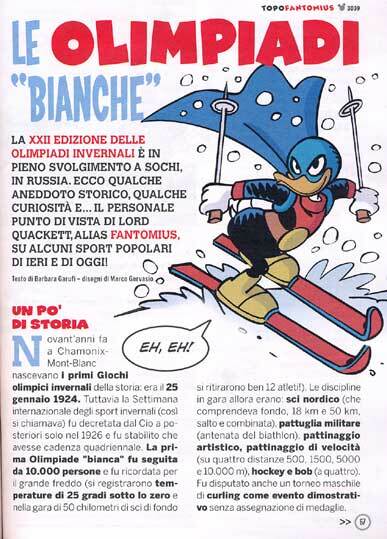 In the story FANTOMALLARD ON THE SNOW the special steam jet skis, that allow with little effort to achieve a significant speed, are shown. In the same story Copernicus, in the Ermine's House , shows us some special ear plugs that allow to hear sounds and conversations over long distances. 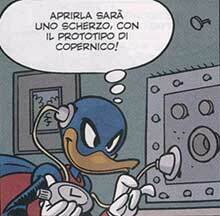 These special equipments were later re-created by Gyro Geraloose (great-grandson of Copernicus ) and used by Duck Avenger. In the story THE AMAZING VENTURES OF FANTOMALLARD -GENTLEMAN BURGLAR- THE BOOTY OF THE BARKSERVILLE Fantomallard has some special boots with air jet propulsion to easily walk over the swamp of Greenduck. In the story THE AMAZING VENTURES OF FANTOMALLARD -GENTLEMAN BURGLAR- THE DOGE'S TREASURE, Dolly Paprika during a carneval party uses a special explosive hand fan. In the story THE AMAZING VENTURES OF FANTOMALLARD -GENTLEMAN BURGLAR- THE NOBLE BEHIND THE MASK, Marco Gervasio shows a special device used by Fantomallard to open the safes. Thus togheter the special acid mushrum and the spring boots this special device was one of the first devices used during the Fantomallard first mission. 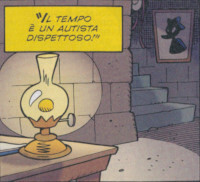 In the story THE AMAZING VENTURES OF FANTOMALLARD -GENTLEMAN BURGLAR- THE THIEF AND THE BILIONARE, Marco Gervasio shows the hypnotic lamp which was the first special device used by Duck Avenger during his first mission against Scrooge. 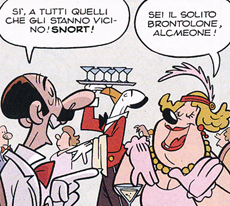 Always in the same adventure THE AMAZING VENTURES OF FANTOMALLARD -GENTLEMAN BURGLAR- THE THIEF AND THE BILIONARE, Fantomallard use a special nose filters against the powerful sleeping gas activated by the secure system of the Scrooge's money bilding. In the story THE AMAZING VENTURES OF FANTOMALLARD -GENTLEMAN BURGLAR- WITHOUT MASK, Fantomallard and Dolly Paprika are using a special steam jet water-scooter for sure also this one designed by Copernicus. Note on the background the Duckburg view with the Scrooge McDuck's money bin on the hill. Of course also in this case the money bin has been drawn in a too modern style respect to the period furthermore if we considered some of the Barks indications in that period the money bin was not yet built on the top of the "killmotors hill". 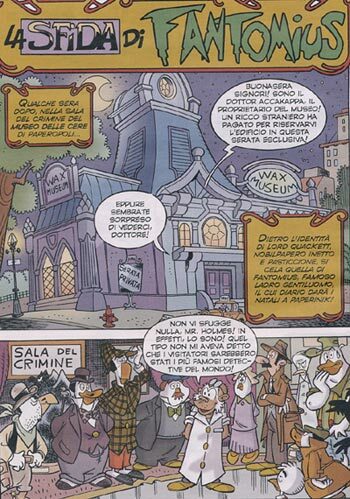 So the artist chose to represent the money bin based on Don Rosa interpretation and with the typical shape of the Italian later stories. In the story THE AMAZING VENTURES OF FANTOMALLARD -GENTLEMAN BURGLAR- THE NIGHT OF THE GEMES, Fantomallard use a special pen which enables the allarm system of the windows. In the story THE AMAZING VENTURES OF FANTOMALLARD -GENTLEMAN BURGLAR- THE TWO AVENGERS, Fantomallard goes to the future in the time period of Donal Duck. 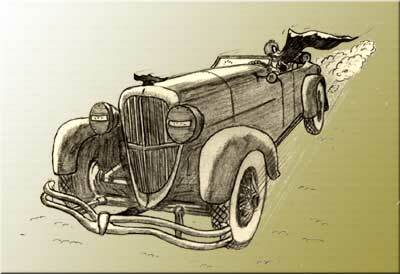 In this adventure he found his old special steam drilling car still inside his secret garage. 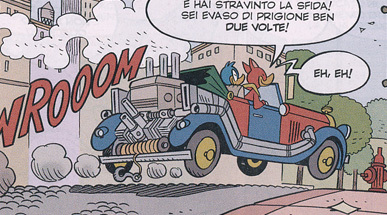 After that Gyro Gearloose has properly restored this drilling car it has been used by Fantomallard and Duck Avenger to get into the Scrooge Mc Duck Money Bin. In some of his undertakings Fantomallard used to impersonate some other people by using rubber masks (as Duck Avenger would do as well). Some of those masks were found by Donald in the Ermine's house as shown in the story DUCK AVENGER AGAINST THE JUNIOR WOODCHUCKS. It is locical to image that the female masks were utilized by Fantomallard's fianceé Dolly Paprika. The rubber masks are largelly used both by Fantomallard and Dolly Paprika in all their adventures of the saga THE AMAZING VENTURES OF FANTOMALLARD -GENTLEMAN BURGLAR-. 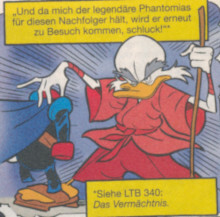 In the third adventure of the saga THE AMAZING VENTURES OF FANTOMALLARD -GENTEMAN BURGLAR- titled PHANOMIUS ON BOARD between the various masks shown in the Fantomallard suitcase one seems to be related to the Uncle Scrooge face. 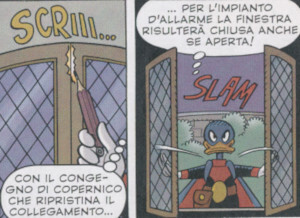 This is a possible indication that Fantomallard was preparing a burglary against Scrooge Mc Duck who in that years was abroad for business. Or maybe Scrooge Mc Duck was also on board of the same ship during this cruise. 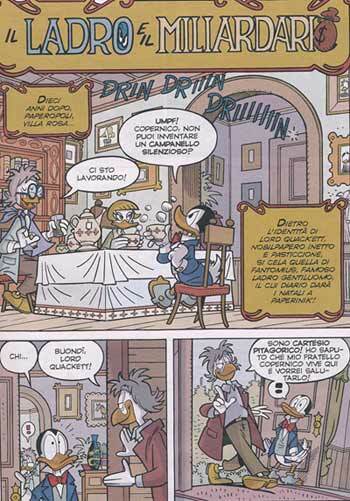 Therefore in the twelfth episode of the Fantomallard saga titled THE NOBLE BEHIND THE MASK Gervasio shows the first encounter between Lord Quackett and Copernicus Gearloose occurred in the 1910 during a party in the Baron Von Duck's mansion. 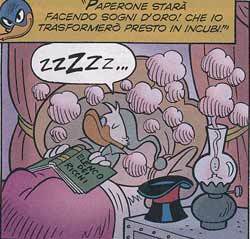 A clear reference to the Don Rosa saga of the Scrooge Mc Duck time and life is given again by Gervasio in the story THE NOBLE BEHIND THE MASK where on a portrait in the laboratory of Copernicus Gearloose the image of Ratchet Gearloose (son of Copernicus) is shown. He is represented in the island of Krakatoa. In the same frame is also told that Ratchet is often traveling around the world together with a very rich person! Another reference to Scrooge Mc Duck is shown in the sixth adventure in the saga of Fantomallard titled THE CURSE OF THE PHARAOH where in the Journal of Duckburg (The Duckburg Times) a paragraph with the news "MC DUCK SEND MORE GOLD ... " can be read. 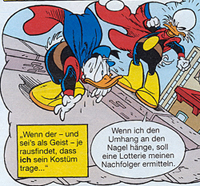 This is a clear philological connection to the saga of Scrooge Mc Duck life and time by Don Rosa according to which the rich duck in that period was just abroad to increase his business, while his sisters in Duckburg take care of his wealth. 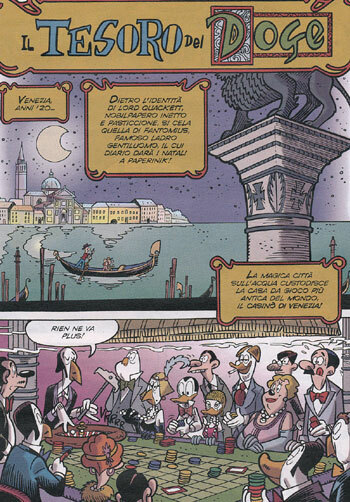 Another clear reference to the Don Rosa's saga is shown by Gervasio in the story THE EIGHTH WONDER OF THE WORLD where the two Scrooge sisters Matilda Mc Duck and Hortense Mc Duck with the husband of Hortense Quackmore Duck (the latters, according to the Don Rosa saga, parents of Donald Duck) are in the DUCK teatre (another obvious tribute to Don Rosa) during the show with the huge gorilla Gong. 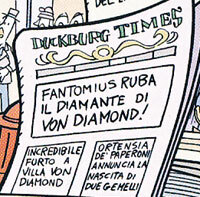 Another important reference to the Don Rosa saga and to the relatives of Scrooge Mc Duck is shown on a frame in the story DOLLY PAPRIKA where a short article on the Duckburg Times of the 1920 reports the announcement of the birth of the Hortense McDuck's twins. The twins are of course Donald and his sister Della. 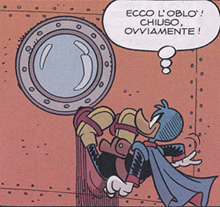 In fact in two vignettes of the story THE CURSE OF THE PHARAOH Gevasio also shows the Scrooge's Money Bin (wrongly represented with its too much modern configuration with the dome which was not still present in the original desing by Barks and Don Rosa). 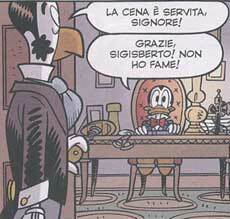 In his saga Gervasio then chooses to follow the version of Don Rosa's universe who wants the Money Bin on the hill already made by Scrooge in 1902 shortly after his arrival in Duckburg. While in the Carl Barks stories initially Scrooge was collecting his money in a Money building located in the city and only in the early 50s he built the famous Money Bin on the hill of Duckburg where the remains of Fort Duckburg were before located. 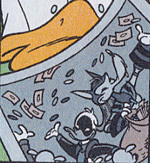 The money bin of Scrooge McDuck is again shown in the last image of the eleventh adventure of the Fantomallard titled THE DOGE'S TRASURE. In this image it seems probable an unexpected and probably secret !? 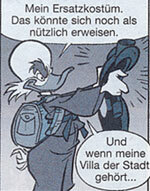 return of Scrooge in Duckburg while in that period he was officialy abroad for busines. 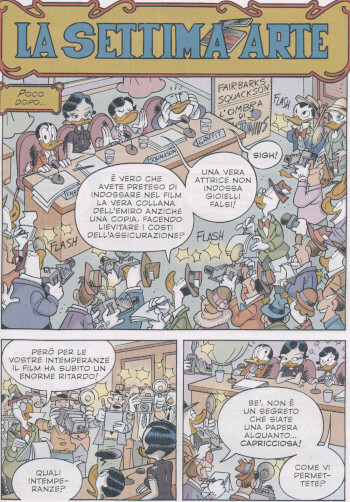 Also in the story about the origins of Fantomallard titled THE NOBLE BEHIND THE MASK placed in the Duckburg of the 1910, Marco Gervasio is showing on some frames the Uncle Scrooge Money bin. 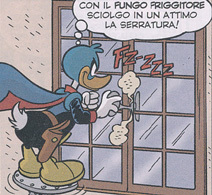 Uncle Scrooge worried about the activities of the gentleman thief temporarily and secretly return to Duckburg in the 1922 as shown by Gervasio in the story FANTOMALLARD OF EGYPT. 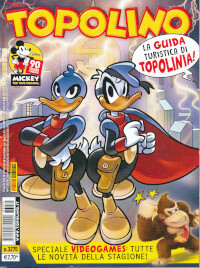 Even in this case for editorial choices the money bin has been represented in updated variant configuration with the dome typic of the Italian stories, while in that period must be only imagined cube-shaped (Don Rosa) or as a simple money-building in town being the money bin in the Duckburg's hill not yet built (Barks). In the story THE AMAZING VENTURES OF FANTOMALLARD -GENTLEMAN BURGLAR- THE THIEF AND THE BILIONARE Scrooge after having meet on board of the Titanic Cartesio Gearloose (who tricks the bilionare pretending to be his brother Copernicus Gearloose father of Ratchet friend of Scrooge) convice the bilionare to get a new security system for his money bilding in order to have a better secure against the famous thief Fantomallard. In the reality the true intent of the bad Cartesio is to steal the precious candy striped rubin. 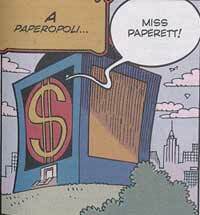 In this story Fantomallard is able to get inside the money building but he did not meet Scrooge. Indeed the rich owner of the money building receive a film on which the gentleman burglar promise to Scrooge to not steal his money untill he is out of Duckburg, but as soon he will be back Fantomallard declare his intent to steal the Scrooge matress while he is sleeping on it...this intent will be accomplished by Duck Avenger many years later. 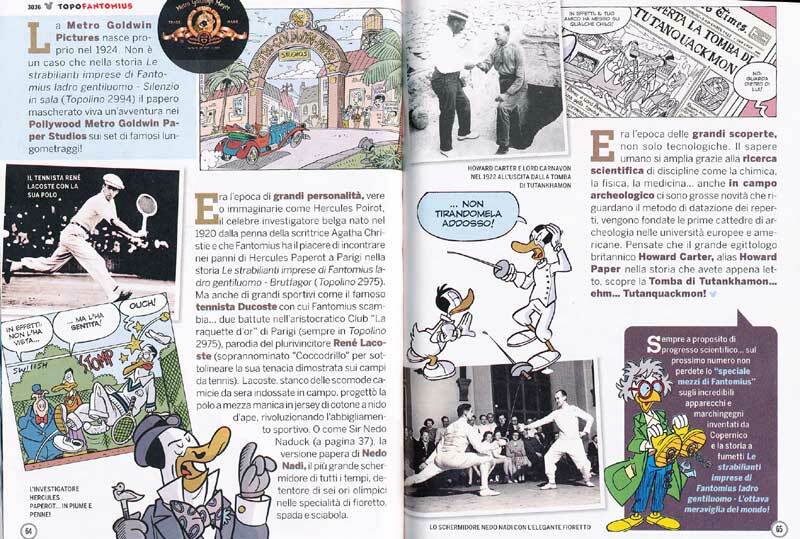 Several views of the Scrooge's Money Bin are also shown in the story LE STRABILIANTI IMPRESE DI FANTOMIUS -LADRO GENTILUOMO- NOTRE DUCK (THE AMAZING VENTURES OF FANTOMALLARD -GENTLEMAN BURGLAR- NOTRE DUCK) dedicated to the famous Notre Duck Cathedral. 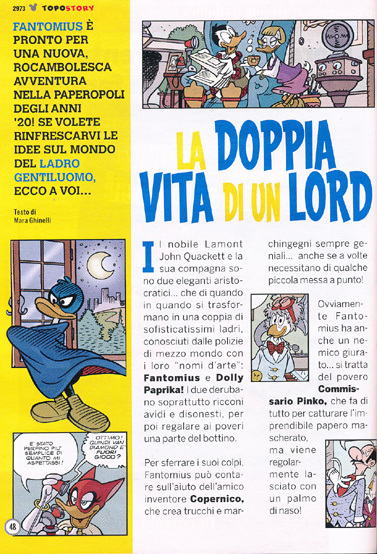 The real Fantomallard and his fiancee are shown for the first time in some flash back of the story DUCK AVENGER AND THE TREASURE OF DOLLY PAPRIKA published on the italian comic book TOPOLINO n� 2675 on March 2007. 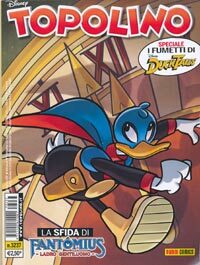 They have been represented again by Marco Gervasion in the story DUCK AVENGER AND THE SECRET OF FANTOMALLARD published on TOPOLINO n� 2902 on July 2011. 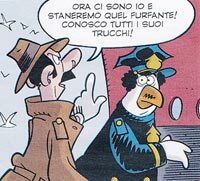 The detective Pinko is also shown, always by Gevasio, in PAPERINIK E IL PASSATO SENZA FUTURO (DUCK AVENGER AND THE PAST WITHOUT FUTURE) where this nevrotic and chaotic policeman is as usual foolished by Fantomallard and in this case also by Duck Avenger disguise as Lord Quackett. The detective Pinko is present in mostly of the gentleman burglar adventures, and of course during the stories he was never able to definitely arrest his enemy Fantomallard. The detective Pinko and his wife Adelaide are shown again in the eleventh adventure of the Fantomallard saga titled THE AMAZING VENTURES OF FANTOMALLARD -GENTEMAN BURGLAR- THE DOGE'S TREASURE where is also indicated that the wife of Pinko is related to the rich Duke Grimani whose family includes three Venetian Doges. 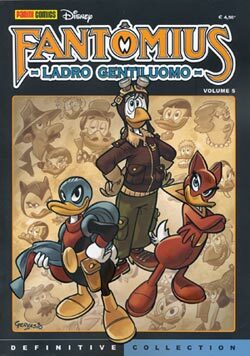 In the twelfth story of the series dedicated to the gentleman thief THE NOBLE BEHIND THE MASK we are shown Alcmeone Pinko is shows in the Duckburg of the 1910 when it was still was active in uniform with the rank of sergent. 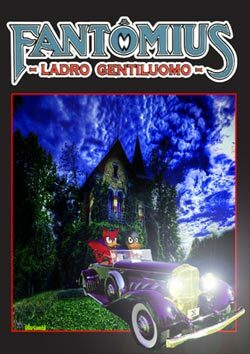 In the fourteenth episode of the saga dedicated to the gentleman thief THE AMAZING VENTURES OF FANTOMALLARD -GENTEMAN BURGLAR- THE TREASURE OF FRANCIS DRAKE Alcmeone Pinko is also visiting Villa Rose to investigate about a kidnapping and the mysterious theft of precious stones belonging to a dress. Even in this situation the detective is far from suspecting the true identity of his friend Lord Quackett. In the sixteenth episode of the saga dedicated to the gentleman thief THE AMAZING VENTURES OF FANTOMALLARD -GENTEMAN BURGLAR- THE THE THIEF AND THE BILIONARE Alcmeone Pinko was almost able to capture Fantomallard on the top of the Scrooge McDuck's money bin. But at the last second the thief was rescued by his friend Copernicus Gearloose. Alcmeone Pinko is shown again in the nineteenth adventures of the Fantomallard saga titled THE AMAZING VENTURES OF FANTOMALLARD -GENTEMAN BURGLAR- WITHOUT MASK. In this story he has been tricked again by the gentleman thief in Ocalulu located in the Sandwich island. 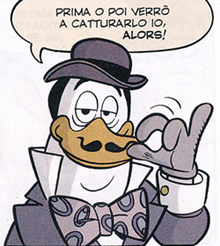 Alcmeone Pinko is also present in the twentieth episode of the gentleman thief saga titled THE AMAZING VENTURES OF FANTOMALLARD -GENTEMAN BURGLAR- THE CHALLENGE OF FANTOMALLARD where, togerther others famous detectives, he is also invited by Fantomallard to the wax museum of Duckburg for a investigative challenge. 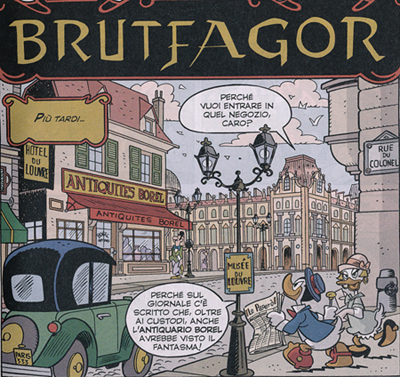 In the fourth part of the Fantomallard saga, titled BRUTFAGOR which takes place in Paris the belgian investigator Hercule Paperot is shown for the first time. This character is based on the famous investigator Hercule Poirot created by the writer Agatha Christie. 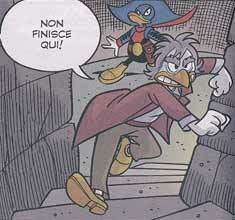 This smart detective after having arrester (thanks also to Fantomallard and Dolly Paprika help) the misterious "Phantom" of the Louvre Brutfagor decides to move in Duckburg and try to catch the famous gentleman burglar Fantomallard. The Belgian detective Hercule Paperot returns in the eighth story (set in the Dark Peak of the Shady Mountains) of the Fantomallard saga title FANTOMALLARD ON THE SNOW. 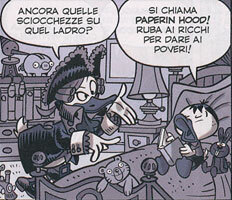 Also this time despite his great skills Paperot is tricked by the smart Duckburgians thieves. 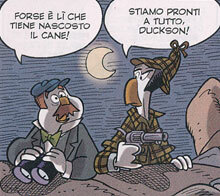 At the end of this adventure makes its appearance another potential and formidable opponent of Fantomallard the famous English detective Ducklock Holmes with his friend Dr.Duckson. Certainly, the skilled Marco Gervasio introduces the two investigators as a prelude to their involvement in one of the next adventures of the gentleman thief. Paper Holmes and his friends Dr. Duckson are in fact back again in the tenth adventure dedicated to Fantomallard titled THE AMAZING VENTURES OF FANTOMALLARD -GENTEMAN BURGLAR- THE BOOTY OF THE BARKSERVILLE. In this adventure the smart private detective from London is almost able to arrest the two thiefs and at the end of the story using the simple logic deduction that "after you have eliminated the impossible, whatever remains, however improbable, must be the truth" he guess, even without having the evidence, the true identity of Fantomallard. I detective Paper Holmes and Hercule Paperot are shown again in the twentieth episode of the saga THE AMAZING VENTURES OF FANTOMALLARD -GENTEMAN BURGLAR- THE CHALLENGE OF FANTOMALLARD. In this story the two British detectives are invited by Fantomallard in the wax museum of Duckburg for an investigative challenge. In the same adventure Gervasio shows for the firts time Chick Paper a smart detective from New York and his assistants Rob and Bob and also the writer of criminal novels Jane Purple. Also these characters are invited by Fantomallard in the wax museum for the same challenge. Also in the twentieth episode of the saga there is an interesting reference to an old character of Gottfredson, the mad scientist Prof. Ecks who in 1924 was the director of the museum of wax of Duckburg. At the end of the story the scientist already demonstrates his criminal nature as in the underground laboratory of the museum he produces latex masks to sell to criminals who try to escape the law. 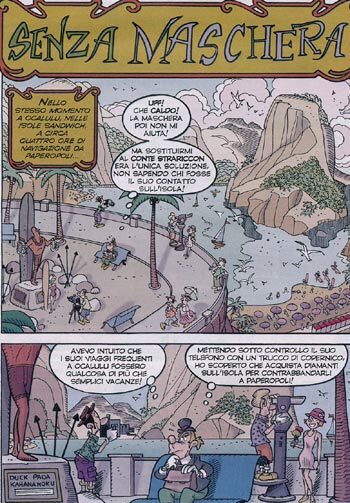 The same character along with two other crazy scientists (Prof. Doblex and Triplex) in 1932 will be protagonists of the frightening adventure of Mickey Mouse and Horace MICKEY MOUSE IN BLAGGARD CASTLE. In the ninth story of the saga dedicated to the gentleman thief titled THE AMAZING VENTURES OF FANTOMALLARD-GENTEMAN BURGLAR-THE MASK OF FU MAN ETCHù,appears for the first time another formidable opponent of Fantomallard, the Chinese maniacal criminal Dr.Fu Man Etchù. One of the insane intent of this shady character, perpetually cooled, is to subjugate pharmacists around the world in order that they would not provide any more the anti allergic medicine and thus many other people like him will suffer from colds. The Dr. Fu Man Etch has at his service Jen Yu better known as Lady Mustard, a pretty Chinese girl former girl-friend and accomplice of Fantomallard several years before he met Dolly Duck. 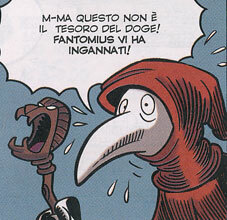 In the eleventh episode of the saga dedicated to Fantomallard titled THE DOGE'S TREASURE Marco Gervasio introduces another formidable opponent of the gentleman thief, the mysterious and dangerous Supreme Guardian head of a secret society known as the Guardians of Venice whose purpose in this first appearance is to get hold of the seven gold symbols of the Doges' power: the horn, the mantle, the sword, the throne, the parasol, eight banners and eight trumpets. 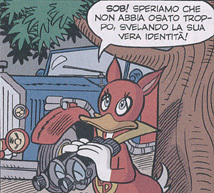 this character is made even more misterious by the fact that it seems know the secret identity of Fantomallard and that he looks so similat in aspect to Copernicus Gearloose!? friend and accomplice of Lord Quackett. The frightening and mysterious Supreme Guardian reappears in a secret laboratory in the thirteenth episode of the saga dedicated to Fantomallard THE CAGLIOSTRO'S RINGS. In this story the criminal is allied with Lady Mustard and he also decalre that his family name is Gearloose!? The true identity of the Supreme Guardian is shown in the fourteenth episode of the Fantomallard saga titled THE TRASURE OF FRANCIS DRAKE. The misterious criminal is in fact Cartesius Gearloose twin of Copernicus. 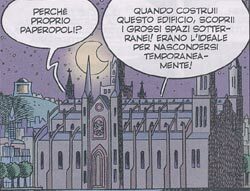 In this episode is also show that Cartesius has his secret laboratory in the hideout of the Three Tower Castle and thus he was probably friend or student/assistant of Spokius Spektrus who also was a extravagant inventor. In the sixteenth episode of the Fantomallard saga titled THE THIEF AND THE BILIONARE, Copernicus Geraloose remaind how during the first year of College due to the bad behaviour of his twin brother Cartesius, he was expelled in the 1869 from the California University of Berkeley. Always in this adventure Cartesius is able to steal from Scrooge the precious candy striped rubin. After this robbery he excape to his secret laboratory insidethe Three Tower Castle. Fantomallard and Copernicus are able to recover the rubin but the bad Cartesius excape one more time. In the twelfth episode of the series dedicated to the gentleman thief titled THE NOBLE BEHIND THE MASK Marco Gervasio shows us Sigisbert who is the butler of Lord Quackett at Villa Rose in 1910. 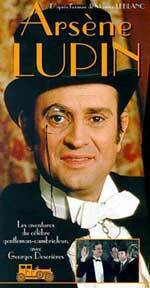 Veru likely this Butler was dismissed with the arrival of Copernicus and then Jen Yu alias Lady Mustard at Villa Rose. 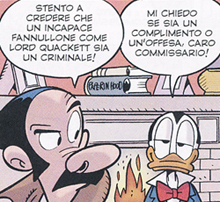 In the story THE AMAZING VENTURES OF FANTOMALLARD-GENTLEMAN THIEF- THE NIGHT OF THE GEMES the author introduces a new terrible enemy of Fantomallard the South African tycoon Flintheart Glomgold the criminal adversary of Scrooge Mc Duck. Flintheart Glomgold is in fact back in the next adventure THE AMAZING VENTURES OF FANTOMALLARD-GENTLEMAN BURGLAR- THE TWO AVENGERS where he abducts Dolly Paprika, when she involontary goes into the future, and he blackmailed Fantomallard asking him to make a robbery against Scrooge Mc Duck. Both Flintheart Glomgold che Lady Mustard are back again in the adventure THE AMAZING VENTURES OF FANTOMALLARD-GENTLEMAN BURGLAR- THE SEVENTH ART. In this story the two villains together try to stoll a preciuos necklace belong to the famous movie star Gloria Squackson, but they are tricked by Fantomallard. 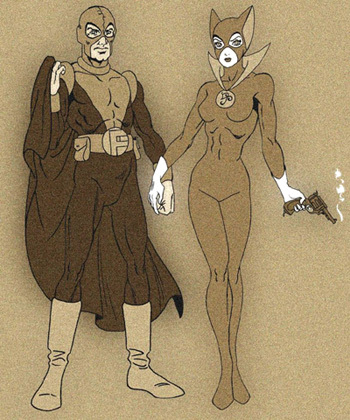 As any famous bandit or masked avenger who had a helper or a female partner (Diabolik-Eva Kant, Zorro-Bernardo, Fantomas-Lady Beltham, Arsene Lupin-Grognard and Natasha ecc...) also Fantomallard realized his undertakings together with his fianceé Dolly Paprika. 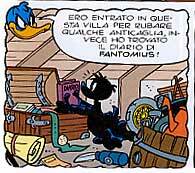 In this story Marco Gervasio shows also the worty pendant of Dolly Paprika which is the secret key for a room, located in the Villa Rose hideout, where Fantomallard keeps his treasure. The entrance of this secret room is hide by a big portrait of Dolly Paprika. Because of the signature this portrait has been painted by Fantomallard himself. 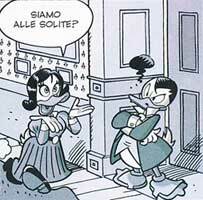 Always in the story DUCK AVENGER AND THE TREASURE OF DOLLY PAPRIKA, a small picture in a room of Villa Rose more likely attested the real aspect of the misterious Fantomallard fiancee; a pretty girl with fair hair comb in the style used during the 20s. 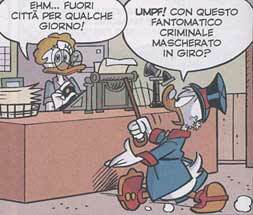 The real look of the Fantomallard accomplice is finaly revealed by Gervasio in his important story PAPERINIK E IL PASSATO SENZA FUTURO (DUCK AVENGER AND THE PAST WITHOUT FUTURE where in the 1920 there is the second decisive encounter between Fantomallard and his future fiance. 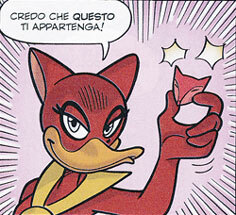 In this story it is also said the true name of Dolly Paprika which is Dolly Duck. 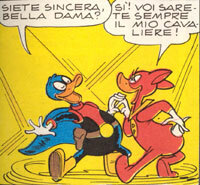 This beautiful story was published on the Italian Disney comic TOPOLINO n. 2933. 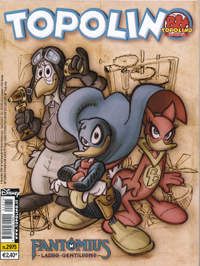 The cover of this comic was also drawn by the awesome artist Marco Gervasio and dedicated to Dolly Paprika and Duck Avenger. In the story THE AMAZING VENTURES OF FANTOMALLARD-GENTEMAN BURGLAR-DOLLY PAPRIKA the first fleeting encounter between Lord Quackett and Dolly Duck is shown. It appened in the 1913 during a boring costume party. Always in the story THE AMAZING VENTURES OF FANTOMALLARD-GENTEMAN BURGLAR-DOLLY PAPRIKA the mother and Margaret, the sister of Dolly Duck, are shown in their dancing school. 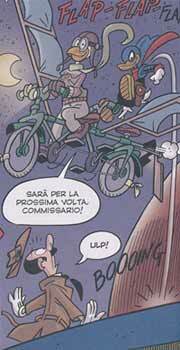 In the same adventure is also shown Lucrezia the eccentric friend of Dolly. 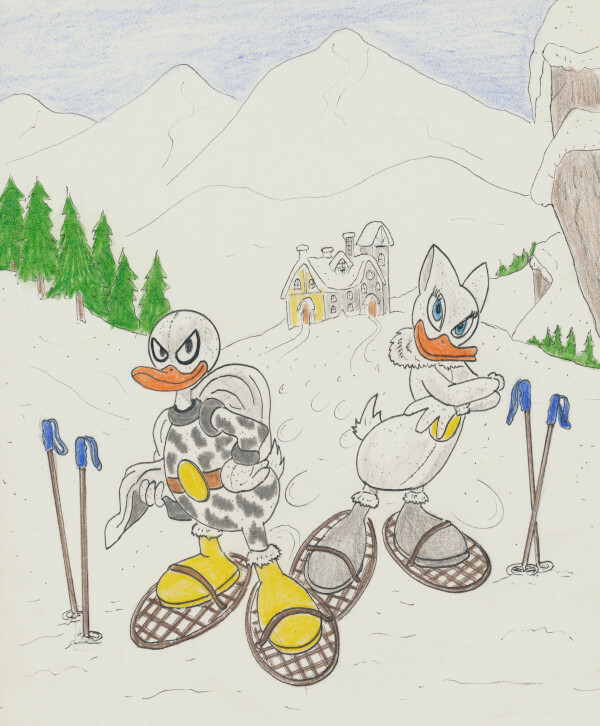 For the mission in snow environment it is logically to guess that Fantomallard and Dolly Paprika worn some special outfit more suitable during the snow winter period. 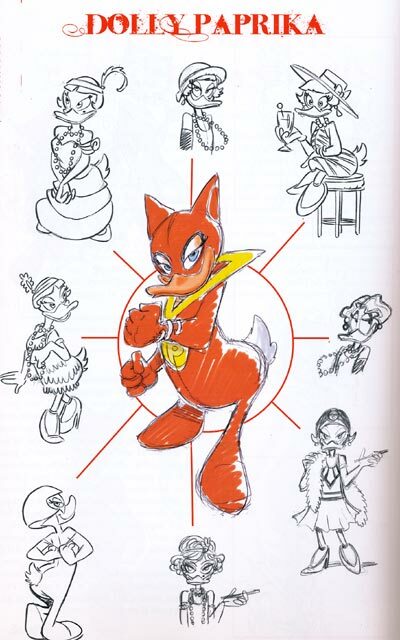 In the story THE AMAZING VENTURES OF FANTOMALLARD-GENTEMAN BURGLAR-DOLLY PAPRIKA also the origin of Dolly Paprika's red fox costume is shown. It is inspired by the Red Fox jewel belonged to her friend Lucrezia and whose recovery at the home of a rich moneylender creditor was the first theft performed by Dolly Duck in the role of Dolly Paprika. In the ninth episode of the series dedicated to Fantomallard titled THE AMAZING VENTURES OF FANTOMALLARD-GENTEMAN BURGLAR-THE MASK OF FU MAN ETCHù Marco Gervasio introduces us to the intriguing character of Jen Yu better known as Lady Mustard, a pretty girl former girl-friend and accomplice of Fantomallard several years before that Lord Quackett met Dolly Duck. .In this story Lady Mustard is not the accomplice of Fu Man Etchù but she is serving the criminal called the Supreme Guardian leader of the sect the Guardians of Venice. Lady Mustard is back in the story titled THE AMAZING VENTURES OF FANTOMALLARD-GENTEMAN BURGLAR-THE SEVENTH ART. 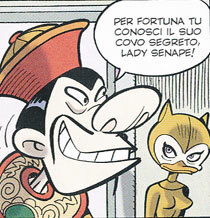 This time she is accomplice of the evil southafrican tycoon Flintheart Glomgold. 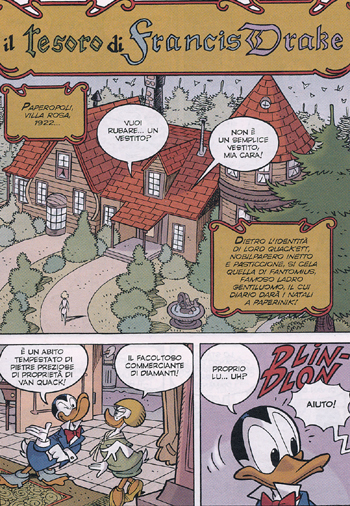 As far as Fantomallard's true identity and name are concerned, an interesting indication is given by Marco Gervasio in his recent story DUCK AVENGER AND THE FANTOMALLARD's SHADE, where during a school excurtion to Villa Rose's remains, the teacher of Donald's nephews describes to them the story of the mansion: " These are the remains of Villa Rose, which belonged to Lord Quackett long ago! Because he didn't have any heirs the mansion become state property". This sentence corresponds to what is said in the first story, that Villa Rose's owner (who we know to be Fantomallard) disappeared without heirs, thus we can deduce that Lord Quackett is nothing more than the true name of Fantomallard!. 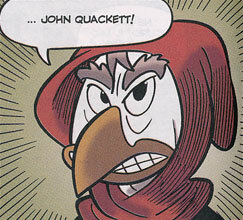 The first name of Lord Quackett which is John appears for the first time in the Gervaso's story DUCK AVENGER AND THE MISTERY OF FANTOMALLARD. It is not clear where the second surname Lamont comes from. It is logically to be intended as his mother's family name of a probably frech origin. It is anyway a right tribute to the french origin of some of the characters of the french letterature whom the gentleman burglar Fantomallard is derived from. 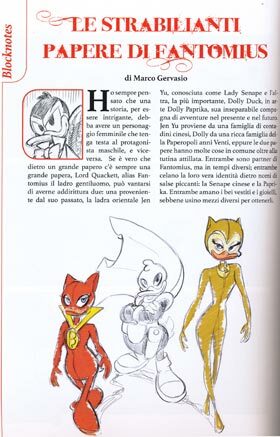 At the beginning little was known about the aspect of Lord Quackett alias Fantomallard, the only references were in some paintings in the story DUCK AVENGER AND THE RETURN TO VILLA ROSE, where Fantomallard face (squared bill, deep glance, curly feathers) without the dark-blue mask is shown. 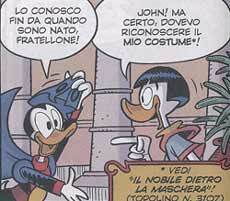 About his characteristic mask, in the beautiful novelized version of the first story, Guido Martina, describing the moment when Donald found Fantomallard's costume, lets us know as follows: "lifting the cover of the false bottom armchair, there was the night black costume with the black cloak, well folded and protected by moth-balls as well as the spring sole boots which allow 30 feet jumps. 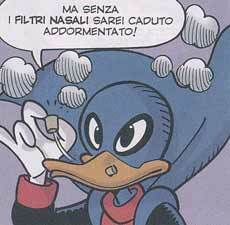 There was also a silk dark mask but Donald didn't make use of it: he had already decided what to use to hide his face!" 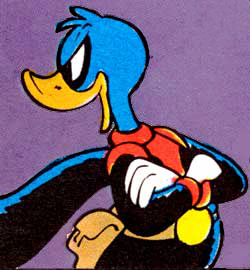 It seems that in the beginning also Duck Avenger should have worn the blue mask of Fantomallard, but to avoid confusion between the younger readers was chosen, in this first story, to left Duck Avenger without any mask. 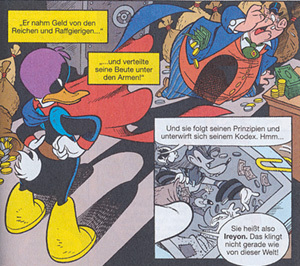 Other sinister pictures of Duckburg's gentleman thief placed in Villa Rose's secret undergrounds are shown in the stories DUCK AVENGER AND THE SUMMER IN VILLA LALLA and DUCK AVENGER AND THE FANTOMALLARD's SHADOW. 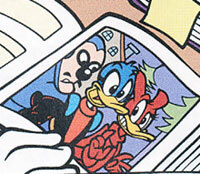 An important indication is present in the story DUCK AVENGER AND THE TREASURE OF DOLLY PAPRIKA where on a picture a blond girl with short hair and an old fashion handsome are shown. More likely these are the portraits of Fantomallard and Dolly Paprika. 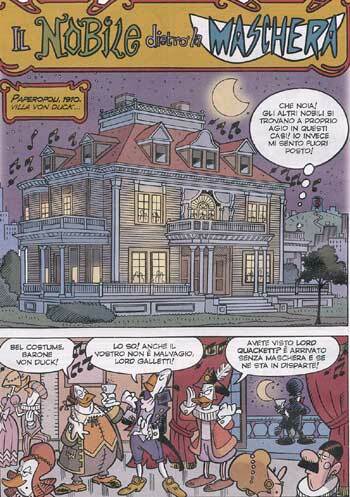 In the same story and in the story DUCK AVENGER AND THE MISTERY OF FANTOMALLARD the images of the Mad Duke of Duckburg and the Phantom of Notre Duck are present in Villa Rose as well. This is also a possible indication that these misterious characters could have been related with Lord Quackett or his fiancee. 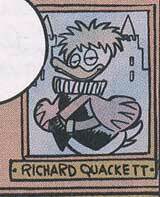 This connection is in fact confirmed on the biography of Lord Quackett published in Italy on the special volume DEFINITIVE COLLECTION edited by PANINI where it is said that the Mad Duke of Duckburg who his real name is Duke Richard Quackett is an ancestor of Lord Quackett and that he was arived in today's Duckburg with the ship Francis Drake in 1579 and later took possession of various land. 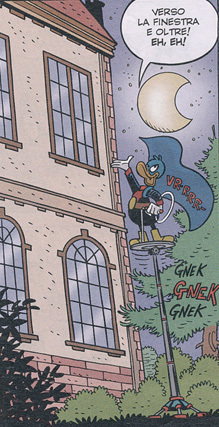 A picture of the Phantom of Notre Duck, is still present in the Villa Rose hideout during the time period of Duck Avenger when the Villa is already destroyed. In fact in some images of the twelfth story of the saga of Fantomallard dedicated to the origins of the gentleman thief titled THE NOBLE BEHIND THE MASK, Gervasio shows us definitively in one of the rooms of Villa Rosa another portrait of the Mad Duke with the indication of his name. 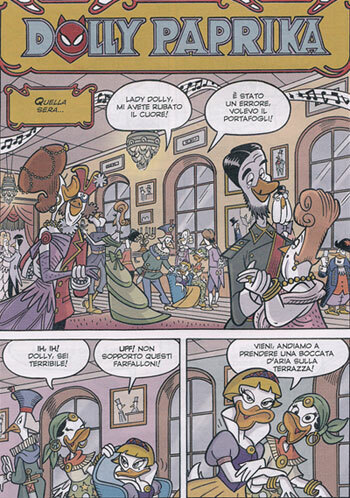 In the eighteen episode of the saga dedicated to Fantomallard titled NOTRE DUCK the author Marco Gervasio Reveals the identity of the mysterious character shows in a picture at Villa Rose who looks like the Phantom of Notre Duck. He was a relative of Lord Quackett's mother Marie Lamont . In 1700 in Paris he was a royal tax collector wearing a black costume to fear the debtors when he was collecting taxes. In the same story, the black costume is taken up by Henry Quackett brother of John to become the first Phantom of Notre Duck. In the fourteenth aventure of Fantomallard saga is finally clarified the story and the identity of the Mad Duke. The Duke Richard Quackett arived in New Albion (renamed Drake Borough) together the crew of Francis Drake in the 1579. The Duke remained in Drake Borough together other settlers after having stollen part of the booty that Francis Drake should have given to the Queen Elizabeth I of England. Than he vested some lands and he built some medieval style castles and manors like his famous castle, the Three Towers Castle and the Dismal Valley Manor. In the 1585 Sir Francis Drake come back to Drake Borough in order to get back the part of his trasure stolled by the Mad Duke. But the Duke warned by his friend Count of Malasorte was able to hide what was left of the trasure and escape probaly in one of his other misterious manors like the Three Tower Castle or the Dismal Valley Manor not known by Francis Drake. Other unidentified portraits are also present in Villa Rose. These could represent possible ancestors of Fantomallard or Dolly Paprika, or even historical duckburgian characters not necessarly related with them. 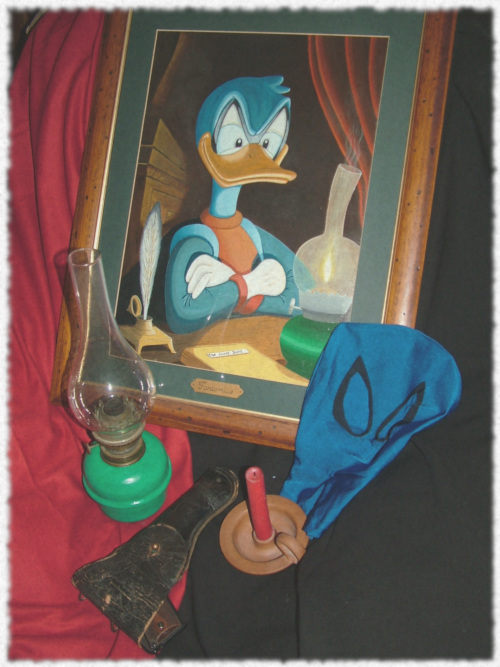 Another strange reference is also given by Marco Gervasio in the fourth part of the Fantomallard' saga titled THE AMAZING VENTURES OF FANTOMALLARD -GENTLEMAN BURGLAR- BRUTFAGOR where in an antique shop of Paris a portrait with a misterious black masked duck is shown. 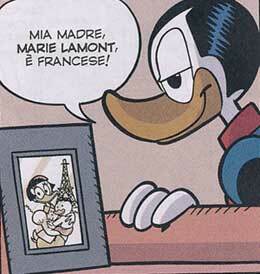 Even if the images reminds the profile of Duck Avenger, for sure in the 1920 he was not yet existing thus we can reasonably suppose that the image represent the relative of Marie Lamont who in the Paris of 1700 was a Royal tax collector famous because his black costume worn to scare the debtors. Also at Villa Rosa in the story THE CURSE OF THE PHARAOH Gervasio shows a picture with the parents of Lord Quackett (Lord Andrew Quackett and Marie Lamont) with on the backdrop of the Eiffel Tower. Another reference to the French origins of the gentleman thief's mother. In a frame of the story FANTOMALLARD OF EGYPT the house of the Quackett family is represented during the 1916. In this image an awards with the name Howard Quackett is shown. we can reasonably imagine he was the grandfather of John and Henry and that he could has been a prominent lawyer lived in London during the middle of the 1800. The Parisian origins and the name of the Lord Quackett's mother, Marie Lamont Are finally revealed in the story FANTOMALLARD ON THE SNOW In fact in the Ermine's House there is a picture with he image of the Child John Quackett in the arms of his mother Marie in Paris. In a flashback of the story THE DOGE'S TRASURE Marco Gervasio shows the house in London where the young John Quackett used to live with his family. In some images the child John ten years old togheter his father the Duke Andrew Quackett are shown. Henry Quackett disappeared in the 1916 was found by John and Dolly in the 1922 as shown in the story FANTOMALLARD OF EGYPT. In this adventure is told that during those years Henry has studied in solitary the architectural techniques of ancient cultures, and finally he decided to live with the people of the surviving civilization of Atlantis beneath the desert of Sahara. In the same adventure the author Marco Gervasio let us know that the architect Henry Quackett has been commissioned by John to design Villa Rose and the relevant secret hideout. Henry Quackett is back in the story NOTRE DUCK. In this adventure dressing a black costume he made several thefts with the aim of helping the Atlantis peoples to rebuild their city destroyed destroyed by a natural cataclysm. Henry hides his booty in the Undergrounds of Notre Duck Cathedral which was designed by himself in the 1916.He keep for himselfs only the coins needed for his eccentric hobby that is to rebuild a "monetary" model of Notre Duck. In the last frame it is understood that Henry could worn the Phantom of Notre Duck outfit also in the future where, himself or more likey a heir of him, will try to steal a whole wheelbarrow of coins from Scrooge's Money Bin is a famous Carl Bark's story. In another picture, visible in the history THE CURSE OF THE PHARAOH Lord Quackett is represented next to a typical aircraft of the World War I. This picture makes us plausibly assume that Lord Quackett has served in Europe during the Great War as a fighter pilot in the armed forces of some country allied states. In the third issue of the special comic book PANINI COMICS; FANTOMIUS-ladro gentiluomo- a beautiful drawing shows the Quackett family with their ancestor the Duke Richard Quackett better known with the nickname of Mad Duke, the Duke Andrew Quackett, Marie Lamont and their sons Henry Quackett and John Quackett alias Fantomallard. In 1579, together the crew of Sir Francis Drake arives in New Albion (today Duckburg) the Duke Richard Quackett, better known with the nick name of Mad Duke. He took possession of several areas and realize some manors in medieval style. In 1585, the Mad Duke escape from his main castle after having stollen part of the trasure of Sir Francis Drake the famous corsair who served the Queen Elizabeth I of England. The Mad Duke probably hide himself in one of his other misterious manors. In 1885 John Quackett was born in London. He was the second son of the Duke Andrew Quackett and Marie Lamont of Paris. In 1903-1907 John Quackett attend the College in Oxford getting a Bachelor Degree in Natural Science. 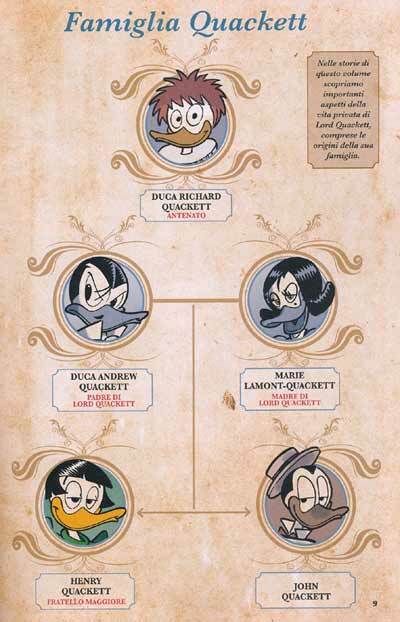 In 1908, at the age of 23, John Quackett moved to Duckburg on the lands belonged to his family and with the help of his brother Henry (who is an architect) they built Villa Rose, his main living house, and the other secret hideouts, afterthat his brother goes back to London. In 1910 John Quackett meets the eccentric inventor Copernicus Gearloose (great grandfather of Gyro Gearloose) and he starts his gentleman thief career with the name of Fantomallard. Copernicus also moves to Villa Rose. In 1912 Fantomallard meets the fascinating chinese thief Jen Yu, alias Lady Mustard, they becomes lover and accomplices for a couples of years. In 1916 Henry Quackett brother of John comes back to Duckburg to starts the construction of the famous cathedral Notre Duck, but during the works he mysteriously disappears without a trace. John found him in Egypt in 1922 discovering that Henry during those years has studied in solitary the architectural techniques of ancient cultures, and finally he decided to live with the people of the surviving civilization of Atlantis beneath the desert of Sahara. 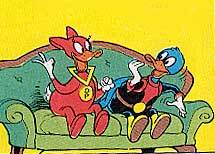 In 1920,during a robbery in a family of nobles in Duckburg, Lord Quackett disguised as Fantomallard meets Dolly Duck (fleetingly already known in 1913 which becomes his fiancèe and accomplice assuming the name of Dolly Paprika. In 1924 Henry Quackett returns secretely to Duckburg and he refugees in the Notre Duck Cathedral which he designed and built in 1916. He disguises himself with a black suit becoming the misterious Phantom of Notre Duck. Some decades later Henry always in the outfit of the black Phantom will try to robbing a whole wheelbarrow of coins from Scrooge's Money Bin in order to complete his "monetary" model of Notre Duck. In 1606 Captain John Duck, British sailor and writer, is one of the founders of the first colony of Jamestown in the American territory of Virginia. He become governor of the area after marrying "Small Playful",the daughter of the Chief of the Native American tribe Powhatan. In 1848 Samuel Duck, a descendant of John Duck and grandfather of Dolly, migrates from the east coast states in California for the gold rush. After becoming wealthy, Samuel Duck is established in Duckburg, where his cousin Dabney Duck (Grandfather of Donald) has a farm. Samuel Duck has a son named Clement. 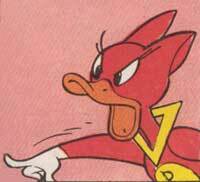 In 1895 Dolly Duck was born in Duckburg. she is the second daughter of the wealthy landowner Clement Duck and Samantha Gander (great-aunt Gladstone). She is a famous dancer, who immediately tries to induce her daughters in his passion. In 1905-1913 Dolly attend, along with older sister Margaret, the famous Dance Academy of Duckburg, acquiring physical skills as well as the agility and balance and the other important psychic abilities such as concentration and emotional control that shall be very useful later on. Nel 1913 during a boring costume party Dolly knows for the first time Lord Quackett that will meet again only in 1920. In 1915 Dolly leaves the dance, because intolerant of the high society sphere. 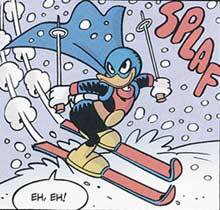 Her Sister Margaret, instead leave Duckburg to continue a successful career as a dancer. 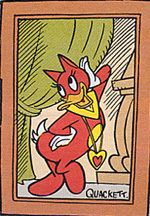 In 1920, at a party in a villa of nobles in Duckburg, Dolly meets for the first time Fantomallard and she becomes his companion and accomplice with the name of Dolly Paprika. In 1825 the young inventor Leonardo Gearloose opens in San Francisco California a laboratory for steam machines design and a few years later he married the French artist Elisabeth Leduck. In 1844 the twins Copernicus and Cartesius were born. Copernicus immediately showed that he had inherited his father's genius, building since he was young complex equipments, but for which his brother, less brilliant, often gets credit. In 1850 after the annexation of the California to the United States, the Gearloose family moved to Duckburg the city state of Calisota. In 1862 The twins are High school graduating. In 1863 Copernicus applies to get the patent for his first invention; a portable voice communicator, and began his career as inventor, renting a small workshop in a basement in Duckburg. Instead his brother becomes an apprentice of the mysterious Spokius Spectrus working in his secret laboratory in the Three Towers Castle. In 1864 Copernicus married the ballerina Anastasia Anatryn and they have a son Ratchet Gearloose. 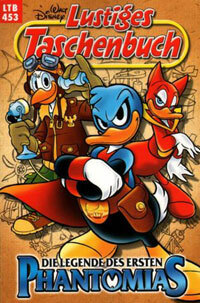 A few years after some mysterious events his wife disappeared and the young Ratchet leaves Duckburg to look for her. In 1868 Copernicus applied for the new University of California in Berkeley (where he met the Egyptologist Howard Duck) but never stop working to his inventions. It was expelled the following year because of his brother. In 1880 Ratchet, brilliant like his father, was in Louisville, Kentucky where he sells pills able to purify the muddy water of the Mississippi river. In that place he was noticed by the young Scrooge MucDuck of which will become friend and companion in adventures. 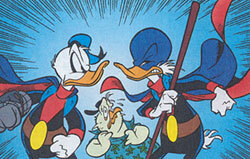 In 1883, Ratchet and Scrooge are witness of the famous eruption of Krakatoa vulcano in Indonesia. 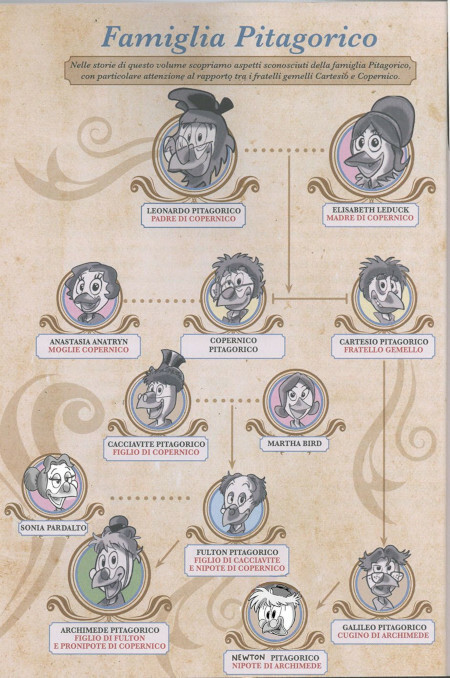 In 1890 Ratchet returned to Duckburg and a year later his son Fulton Gearloose was born Fulton will be the future father of the famous Gyro Gearloose. 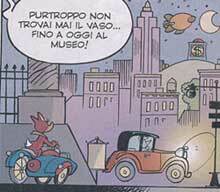 In 1906 Ratchet left again Duckburg, probably with his friend Scrooge, visiting different countries in the world. In 1910 Copernicus Gearloose knows the noble of Anglo-French origin Lord Quackett alias Fantomallard and after some events they become good friend and Copernicus moved to Villa Rose where he made for Fantomallard a variety of pecial devices. 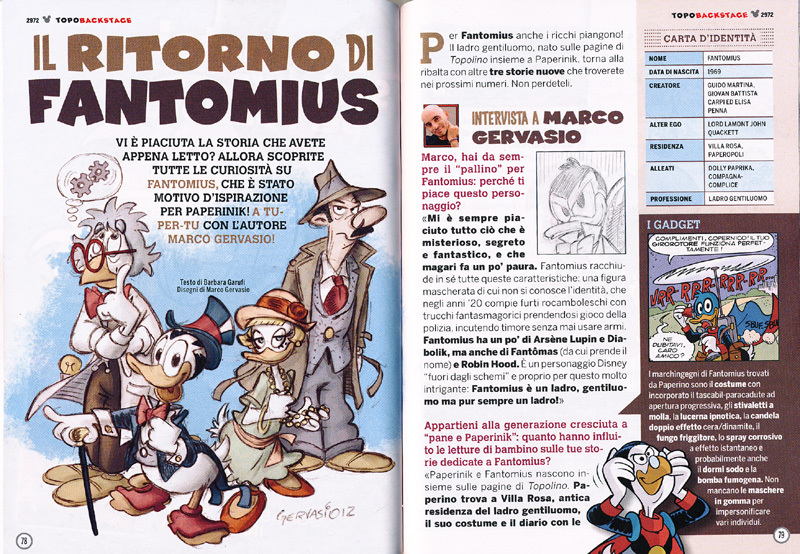 In the fourth issue of the special comic book PANINI COMICS; FANTOMIUS-ladro gentiluomo- a beautiful drawing shows the Gearloose family with Leonardo Gearloose father of Copernicus and Cartesius, The well known Ratchet Gearloose and Fulton Gearloose but very important Marco Gervasio also includes (not in the version printed in the PANINI comic) Sonia Pardalto mother of Gyro Gearloose which was shown for the first time in a Brasilian story. 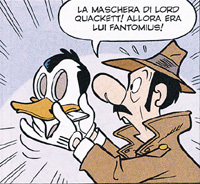 The real face of Lord Quackett alias Fantomallard is finaly shown by Marco Gervasio in the story PAPERINIK E IL PASSATO SENZA FUTURO (DUCK AVENGER AND THE PAST WITHOUT FUTURE) which is placed in the Duckburg of the 1920. Well made is the general outfits of the character with his Diabolik stile black hair and his romantic and gallant behaviour who remaind the gentleman thief Arsène Lupin. 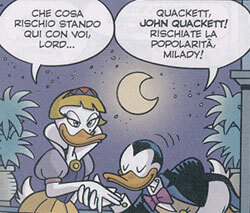 In this beautiful and important story the character of Lord Quackett is also interpreted by Duck Avenger who for a mistake has been transferred into the past and is thus obligated to interfere with the events of the real Fantomallard and Dolly Paprika. 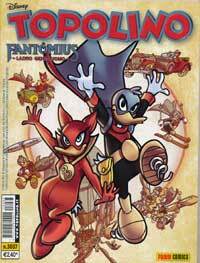 On the Italian Disney comic book TOPOLINO n. 2972 November 2012 the saga dedicated to the adventures of Fantomallard it is for the first time published. These stories created by the good Duaney artist and writer Marco Gervasio are titled THE AMAZING VENTURES OF FANTOMALLARD -GENTLEMAN BURGLAR-. All these adventures taking place in the first decades of the 1900 and their shown some of the most remarkable ventures of Fantomallard and Dolly Paperika in a perfect old style and with several references to famous characters from letterature and history comics like Fantomas, Arsène Lupin, Diabolik, Zorro, etc.. The first adventure of this saga is titled THE PINK MOUNT. In this story the double identity of the smart gentleman thief is shown. He pretend to be awkward and meddler when he is Lord Quackett but he is smart and synister avenger when he act as Fantomallard. On a frame of this story it is also shows the Fantomallard's business card wich it is sometimes left as signature of his robbery. This first story of the Fantomallard saga is also correlate by a very interesting interview made by Barbara Garufi to the stories' author Marco Gervasio. 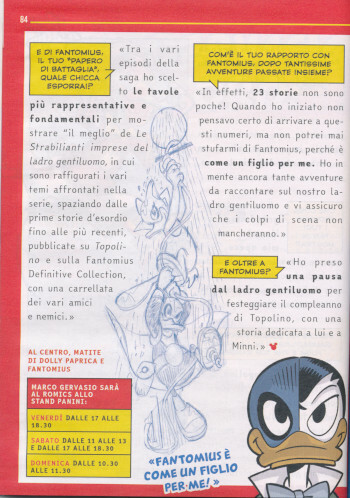 The six page of the article are correlated with new drawing and general news about the main characters of the saga and historical information about the origin and the first appearance of Fantomallard in the Guido Martina's Italian Disney stories during the late 60s early 70s. In the second part of this saga titled THE FANTOMALLARD ESCAPE the gentleman burglar is unmasked and arrested by the detective Pinko. 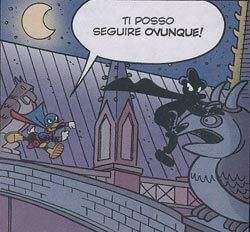 Of course at the end of the story Fantomallard escapes from the prison and he also let to pretend that he was wearing the rubber mask of Lord Quackett so that the stupid detective was still confuse about the true identity of the misterious masked thief. Also this story is correlate with a full page article by Mara Ghinelli with some informations about the main characters appearing in this saga. In the third part of the saga titled FANTOMALLARD ON BOARD the gentleman burglar and his fiance are making a rash robbery on board of a cruise-ship. 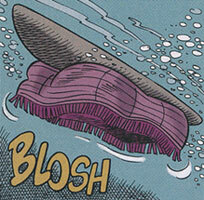 Also in this case Fantomallard was able at the last moment to escape from the detective Alcmeone Pinko. But the unluckly detective at least arrested another thief which incredibly was the ship's capitain. Also this third story is correlated with an interesting article by Mara Ghinelli where several informations an curiosity about this saga are given. In the fourth part of the Fantomallard saga which is titled BRUTFAGOR the gentleman thief and his fiancè are in Paris where a misterious "Ghost" named Brutfagor is acting inside the Louvre museum. Of course this story takes reference to the famous European TV serial of the 60s titled Belphegor -The phantom of the Louvre). In this story it is clear thta the two Duckburgian thiefs seem very familiar with the city of Paris. 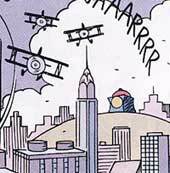 This is a possible sign of some kind of link with this city maybe due to the fact that the Fantomallard's mother family Lamont are very likely from Paris.. Also this fourth adventure is correlated with a page by Mara Ghinelli where general information about Fantomallard are given. In the next story of the series THE AMAZING VENTURES OF FANTOMALLARD -GENTLEMAN BURGLAR- titled SILENCE IN THE MOVIE THEATER the TOPOLINO editing and Marco Gervasio made an interesting tribute to the silent cinema. In this " mute" story the characters don抰 talk with the classical clouds but all the scene are represented in perfect silent cinema style with a lot of action and some explicative frames. 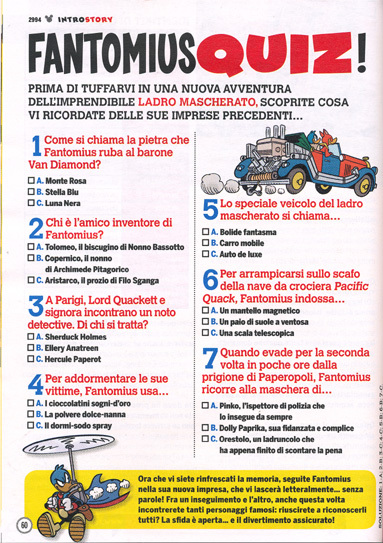 The story is also correlated by a FANTOMALLARD QUIZ page with some questions about the previous adventures of the same series dedicated to the gentleman burglar. 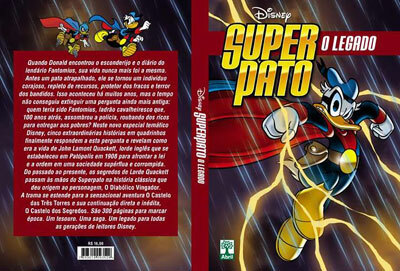 The first five stories of the saga THE AMAZING VENTURES OF FANTOMALLARD -GENTLEMAN BURGLAR- have been also published in Brasil on a special comic book titled SUPERPATO O LEGADO. 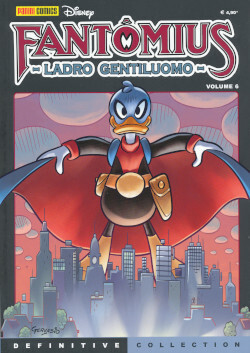 This volume also includes an interview to Marco Gervasio O BIÒGRAFO DE FANTOMIUS and the reprinting of some Duck Avenger stories as for instance PAPERINIK IL DIABOLICO VENDICATORE, PAPERINIK E IL CASTELLO DELLE TRE TORRI, PAPERINIK E IL CASTELLO DEI SEGRETI. The first four stories of the saga THE AMAZING VENTURES OF FANTOMALLARD -GENTLEMAN BURGLAR- have been also published in Italy in October of 2014 in the first issue of the comic book Series DEFINITIVE COLLECTION edited by PANINI. This issue is dedicated to the Disney character of Fantomallard and also contains unpublished drawings by Marco Gervasio, an interview to him and an interesting and detailed biography of Lord Quackett. Very eye-catching and intriguint image on the cover, also made by Marco Gervasio, mingled by the funny image of a far-fetched as unlikely modern bottle of orange D.O.C. instead of the usual bottle of Champagne! The next four stories of the saga THE AMAZING VENTURES OF FANTOMALLARD -GENTLEMAN BURGLAR- were again published in Italy in June 2015 on the second volume of the Series DEFINITIVE COLLECTION published by PANINI. 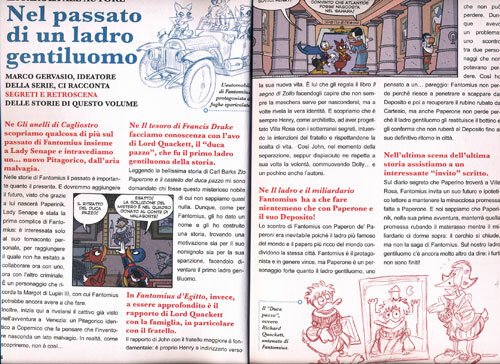 This second number dedicated to Fantomallard contains not only the fifth, sixth, seventh and eighth story of the saga but also unpublished drawings by Marco Gervasio, an interview and an interesting and detailed biography of the Fantomallard girlfriend and accomplice Dolly Duck. Very beautiful the cover also by Marco Gervasio with aother of the extravagant marchinery used by the gentleman thief and his accomplices. 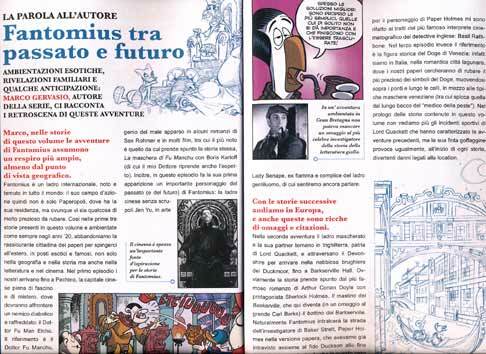 The other four other stories in chronological order of the saga THE AMAZING VENTURES OF FANTOMALLARD -GENTLEMAN BURGLAR- were again published in Italy in February 2016 on the third volume of Series DEFINITIVE COLLECTION published by PANINI. This third issue dedicated to Fantomallard contains in addition to the stories of the saga from ninth to twelfth also unpublished drawings by Marco Gervasio, an interview and the interesting and detailed biography of Copernicus Gearloose . Very nice also a full page drawing dedicated to the Quackett family. The next four stories in chronological order of the saga THE AMAZING VENTURES OF FANTOMALLARD -GENTLEMAN BURGLAR- were again published in Italy in August 2016 on the fourth volume of Series DEFINITIVE COLLECTION published by PANINI. 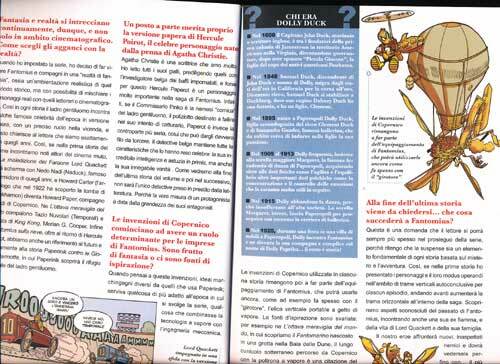 This fourth issue dedicated to Fantomallard contains in addition to the stories of the saga from 13th to 16th also unpublished drawings by Marco Gervasio, an interview and the interesting full page drawing dedicated to the Gearloose family. 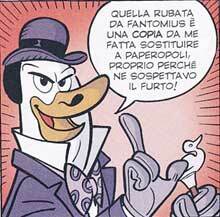 The next three adventures in chronological order of the saga THE AMAZING VENTURES OF FANTOMALLARD -GENTLEMAN BURGLAR- were again published in Italy in December 2017 on the fifth volume of the series DEFINITIVE COLLECTION published by PANINI. also this number dedicated to Fantomallard contains in addition to the stories of the saga from 17th to 19th some unpublished drawings by Marco Gervasio. In the sixth volume of the DEFINITIVE COLLECTION published in Italy in the 2018 by PANINI have been reprinted other three adventures of the saga dedicated to Fantomallard LE STRABILIANTI IMPRESE DI FANTOMIUS 朙ADRO GENTILUOMO-. also this number contains in addition to the stories of the saga from 20th to 22nd some unpublished drawings by Marco Gervasio. 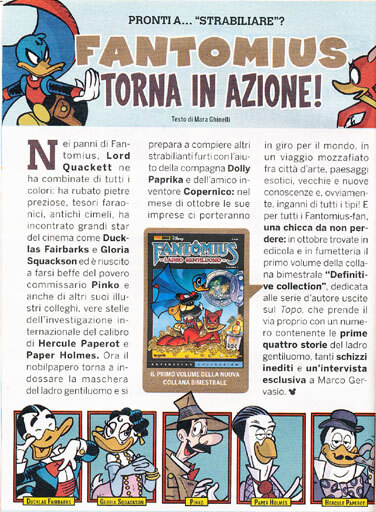 In the march of the 2018 the italian publisher PANINI print the beautiful volume LE STRABILIANTI PAPERE DI FANTOMIUS -LADRO GENTILUOMO- (THE AMAZING FEMALE DUCK OF FANTOMALLARD-GENTLEMAN BURGLAR). The book reprints in a larger format some of the adventures with both Dolly Paprika and Lady Mustard, the two Fantomallard patners who act together the gentleman thief in differnt time period. 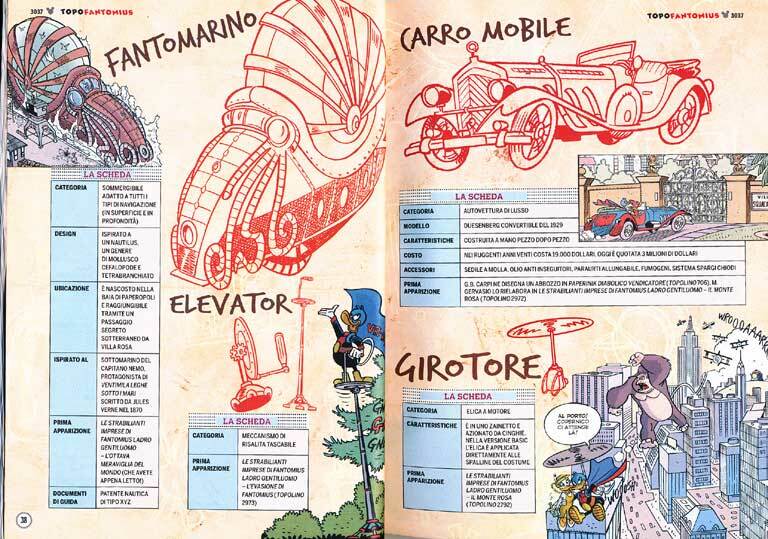 The book includes: THE MASK OF FU MAN ETCHU&grave;, THE RINGS OF CAGLIOSTRO, DOLLY PAPRIKA and interesting drawings and a article also made by the italian Disney artist and writer Marco Gervasio. 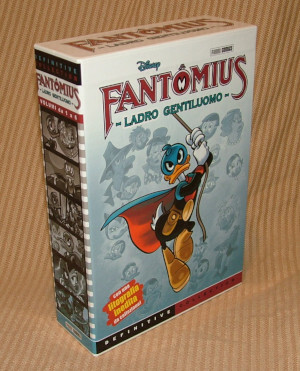 In the october of the 2018 is published in Italy by PANINI a beautiful box which includes the first six number of the DEFINITIVE COLLECTION dedicated to the Fantomallard saga. The special box also includes an awesome collectible lithography always drawn by Marco Gervasio. The volume n. 5 of the DEFINITIVE COLLECTION dedicated to the Fantomallard' saga is reprinted in the 2019 with a different cover. 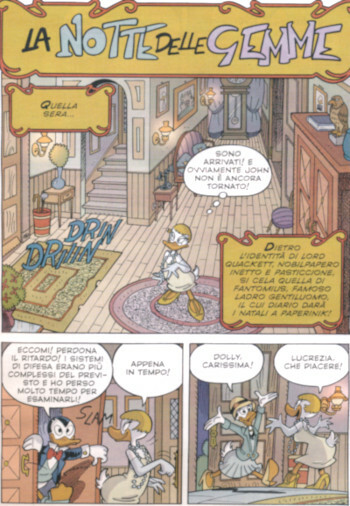 Fantomallard and Dolly Paprika, during their cruice on board of the Pacific Quack, are also shown in a couple of frame in the third part of the story PAPERINIK SULL'OCEANO SCOMBINATO (PHANTON DUCK ON THE CHAOTIC OCEAN). 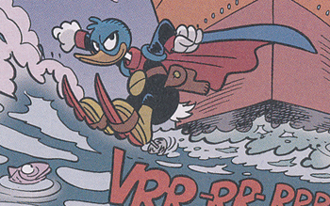 In this story Duck Avenger is involved in strange temporal distorsion caused by the mad scientist Emil Eagle which brings back ships coming from different time periods in a area of the Pacific Ocean. In the sixth story of the series THE AMAZING VENTURES OF FANTOMALLARD -GENTLEMAN BURGLAR titled THE CURSE OF THE PHARAOH the good artist and writer Marco Gervasio offers us a great adventure that shows the gentleman thief, his girlfriend and their friend Copernicus struggling with the mummy and its alleged curse of the pharaoh Tutanquackmon's treasure which has been exhibited at the Museum of Duckburg. Clear historical references to the famous discovery of the tomb of Tutankhamun took place in that period by a team of researchers and archaeologists assisted by Howard Carter and financed by Lord Carnarvon (respectively Howard Paper and Lord Papervon in the Gervasio story). Also this adventure is correlated with a well-designed five-page editorial titled THE FANTOMALLARD ROARING '20s where Garufi Barbara tells us about that period by combining the colorful drawn from the various stories of the saga with black and white vintage photos of the various characters and historical events including Louis Armstrong , the Titanic, airships, tennis (Lacoste), fencing (Nedo Nadi in this story "ducktomized" in Naduck) and Charles Lindbergh with his plane "Spirit of St. Louis" during his first Atlantic non-stop flight also remembered in the first strip of Mickey Mouse in the newspapers of the 1930 written by Walt Disney. In the seventh story of the series b>THE AMAZING VENTURES OF FANTOMALLARD -GENTLEMAN BURGLAR- titled THE EIGHTH WONDER OF THE WORLD Marco Gervasio proposes another magical adventure full of philologicalreferences. The script is clearly inspired to "King Kong"" by Schoedsack and Cooper (who also appears in the final sequence). Several references are placed ranging from Frankenstein to Superman, Spiderman to Nagai anime and of course the Nautilus Jules Verne. From the point of view of the philological references in a cartoon the two sisters Scrooge Mc Duck Matilda and Hortense are shown with the Hortense's husband Quackmore Duck. 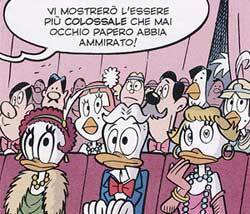 Another tribute to Don Rosa appears in the cartoon in which the name of the theater is D.U.C.K. THEATRE In addition also the Scrooge Money Bin is shown on the Duckburg hill. Definitely wonderful is the editorial of Barbara Garufi FANTOMALLARD ALWAYS IN THE MIDDLE ... where are shown with beautiful drawings, several cutaways and technical detailed information of the amazing machines created by Copernicus and used up to now by Fantomallard in the various episodes of the saga: The special car, the special side car, the aerostatic baloon, the aerocycle, The Phantomarine, The Elevator, the gyro-rotors and the pocket glider. On the occasion of this seventh story of the series THE AMAZING VENTURES OF FANTOMALLARD -GENTLEMAN BURGLAR- Marco Gervasio also realizes the stunning cover of the comic book TOPOLINO n. 3037 Dedicated to Fantomallard his partner Dolly Paprika and their friend accomplice and inventor Copernicus Gearloose with on the background some of their special machinery. The eighth adventure series THE AMAZING VENTURES OF FANTOMALLARD -GENTLEMAN BURGLAR- titled FANTOMALLARD ON THE SNOW, published in the TOPOLINO n. 3039 Gervasio shows the thief gentleman and his partner involved in one of their classic robbing against the various rich and snob guys from Duckburg. The story is set in the mountain near the winter house of Fantomallard, the Ermine's House (called in this story Woodchuck's House!?) Situated on Dark Peak in the Shadowy Mountains. In this adventure Fantomallard is again struggling with the clever Belgian detective Hercule Paperot while in the final vignette another famous detective Ducklock Holmes and its collaborator Dr. Duckson are shown (clear reference to Sherlock Holme and Dr. Watson) surely the prelude to their involvement in one of the next adventures of the gentleman thief. This adventure also shows a slight change of appearance of Fantomallard without the two characteristic "wild tufts" above his head. This configuration makes it even more similar in the aspect to the Italian dark comics character Diabolik. 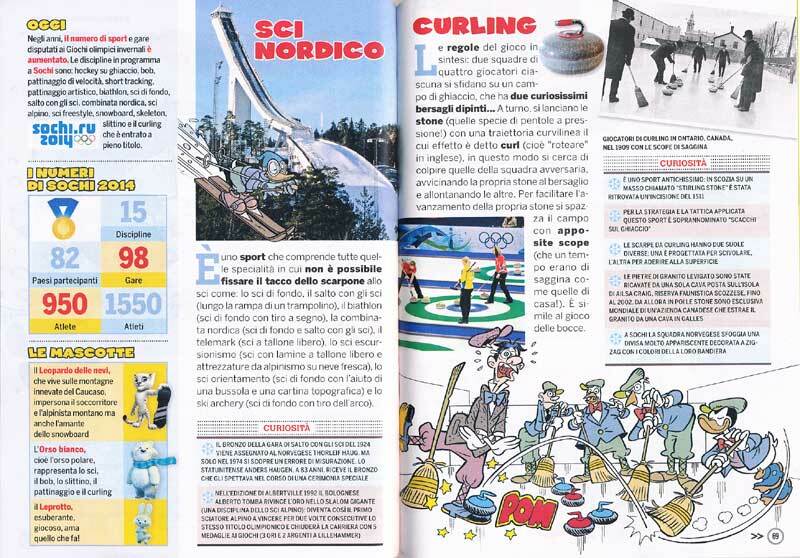 This story is followed by an interesting editorial by Barbara Garufi on the Winter Olympic sport, with several vintage images and some beautiful drawings by Marco Gervasio. The ninth adventure of the saga THE AMAZING VENTURES OF FANTOMALLARD -GENTLEMAN BURGLAR- title THE MASK OF FU MAN ETCHÙ, published in the Italian comic book TOPOLINO n. 3072, it is show Lord Quackett, Dolly Duck and Copernicus in China engaged in the theft of the precious and mysterious golden mask of Genghis Ghat. In this story the talented Gervasio introduces us to the intriguing character of Jen Yu better known as Lady Mustard a former gir-friend and accomplice of Fantomallard and the fearsome criminal Dr. Fu Man Etchù a clear tribute to the famous evil genius Dr. Fu Manchu created by the British writer Sax Rohmer (Arthur Sarsfield Ward) at the beginning of the 1900. Always great the attention to detail and the vitality of the characters typical of the stories created or designed by Marco Gervasio. 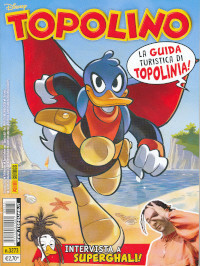 Also in this case the adventure is preceded by a short but well-structured editorial by Mara Ghinelli working for the editorial staff of the Italian Disney comic book TOPOLINO. 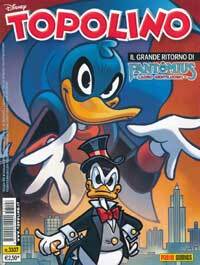 Dedicated to this ninth story of the saga THE AMAZING VENTURES OF FANTOMALLARD -GENTLEMAN BURGLAR- is the cover of the comic book TOPOLINO n. 3072 which shows a great representation of Fantomallard and Dolly Paprika drawn by Giorgio Cavazzano and colored by Marco Gervasio. 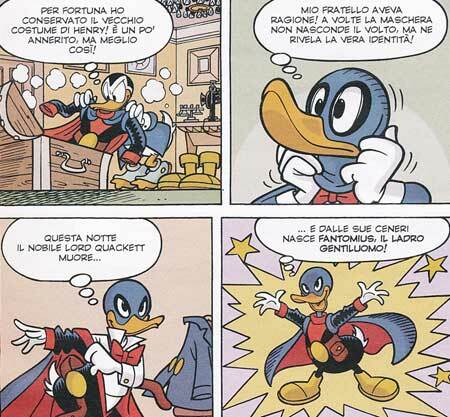 The tenth adventure of the saga THE AMAZING VENTURES OF FANTOMALLARD -GENTLEMAN BURGLAR- THE BUTTY OF THE BARKSERVILLE, published on TOPOLINO n. 3073, shows Lord Quackett and Dolly Duck in England to take over the hidden treasure of Hugo Barkserville. In this beautiful adventure Fantomallard and his partner are likely to being arrested by the skilled investigator Paper Holmes and his friend Dr Duckson. The story is well structured and there are several cross-references, as a tribute to Conan Doyle's novel THE HOUND OF THE BASKERVILLES, and the reference to Carl Barks, who in time had also parodied the same adventure. 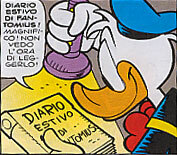 Gervasio traces quite closely (with the necessary simplifications) the plot of the novel, outlining a Paper Holmes interesting, apparently similar to the other Disney character of Ser Lock created by the Studio Diaz, but actually has the same vision of the true Holmes so that at the end of the story for simple logical deduction he is able to guess the true identity Fantomallard . 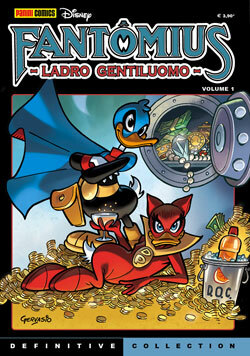 In the eleventh story of the saga THE AMAZING VENTURES OF FANTOMALLARD -GENTLEMAN BURGLAR- THE DOGE'S TREASURE, published in the TOPOLINO n. 3075, Gervasio shows Lord Quackett and Dolly Duck in the magical city of Venice, struggling with the lost treasure of the Doge and a mysterious and fearsome secret society called "The Guardians of Venice". But it is not only the adventure plot itself to capture the reader's attention but two other passages of the story: a childhood flashback of John Quackett and the relationship with his father and the final ,feuilleton style, with the appearance of two mysterious characters whose roles are still well unclear but that go to delineate more markedly a continuity, however, already present in the stories of the character. Again there are references to movies or old Disney stories like the motorized gondola that leaves the canal as in the 007 film MOONRAKER and the reference to the character of Paperin Hood who appeared on the parody of Romano Scarpa THE LEGEND OF PAPERIN HOOD. 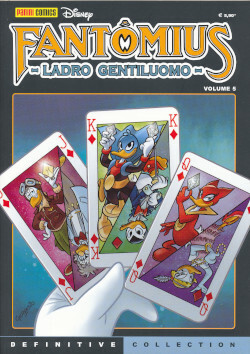 In the twelfth story of the saga THE AMAZING VENTURES OF FANTOMALLARD -GENTLEMAN BURGLAR- titled THE NOBLE BEHIND THE MASK, published in the TOPOLINO n. 3107, Gervasio shows us the origins of Fantomallard in various flashbacks placed both during childhood of John Quackett in London in 1895 and in Duckburg during the 1910. In the the parents of John Quackett his older brother Henry Quackett are shown. The old custom of Henry used during masquerades, will become many years later the outfit of Fantomallard. This beautiful story is also shown the first encounter between Copernicus and Lord Quackett and the first mission carried out by the gentleman thief. 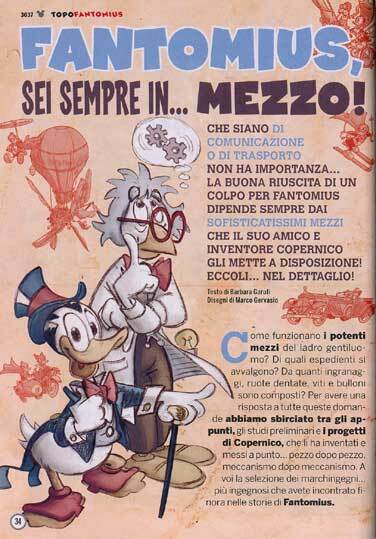 As for his style Marco Gervasio also fits into the adventure interesting and important philological references to stories of other writers as Barks and Don Rosa as well as the first adventure of Duck Avenger created by Guido Martina. 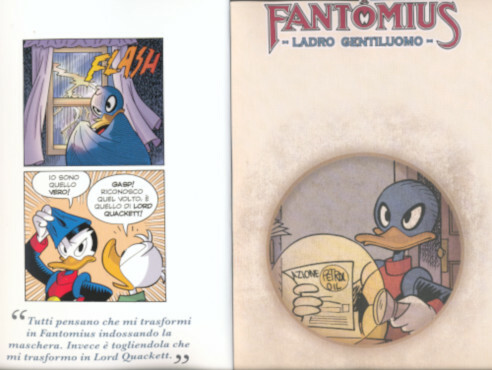 Well made by Marco Gervasio the sequences about the time when Lord Quackett for the first time assumes the secret identity of Fantomallard wearing tights base and the mantle of a party costume belonged many years before to his older brother Henry Quackett. 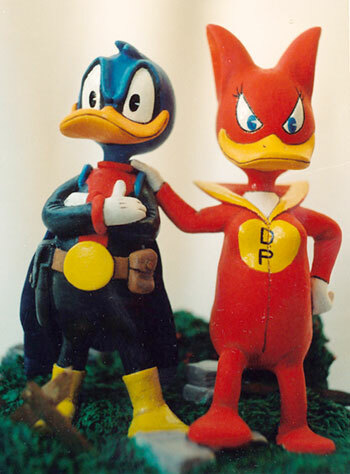 The scenes are a remarkable tribute to the early history of Duck Avenger (THE DIABOLICAL DUCK AVENGER) which are modeled on the sequence in which Donald for the first time is wearing the costume Fantomallard to become Duck Avenger. As a tribute of this twelfth story of the saga THE AMAZING VENTURES OF FANTOMALLARD -GENTLEMAN BURGLAR- The TOPOLINO n. 3107 cover shows an awesome drawing of Marco Gervasio dedicated to the origin of Fantomallard. 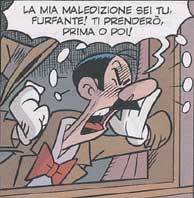 This thirteenth episode of the saga dedicated to the gentleman thief THE AMAZING VENTURES OF FANTOMALLARD - GENTLEMAN BURGLAR- titled THE CAGLIOSTRO'S RINGS, published in the TOPOLINO n. 3108 offers us interesting references to the life of Lord Quackett alias Fantomallard before he meet his current partner Dolly Paprika. Excellent the narrative sequences of this articulated hunt of the Count Cagliostro's treasure, who as general plot shows similarity with an episode of the adventures of Arsène Lupin. 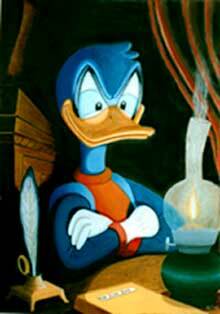 Interesting for every lover of stories Duck Avenger is the Latin phrase SURSUM CORDA used by Guido Martina in history DUCK AVENGER AND THE SCHOOL OF KRIMEN and by the trio Mainardi, Perini and Migheli in the history LUDWIG VON DRAKE AND RETURN TO THE SCHOOL OF KRIMEN . Particularly well made the final with the mysterious and dangerous character of the Supreme Guardian leader of the sect the Guardians of Venice that seems to be actually the accomplice friend of Fantomallard... double identity!? ... or a relative?! 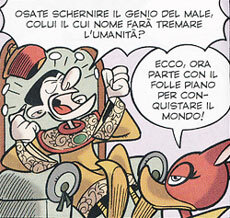 The fourteenth episode of the saga dedicated to the gentleman thief THE AMAZING VENTURES OF FANTOMALLARD - GENTLEMAN BURGLAR- titled THE TREASURE OF FRANCIS DRAKE, published on TOPOLINO n. 3139 shows some philological references and characters only briefly mentioned in Barks, Don Rosa and Guido Martina stories. It is in fact shown for the first time the character of the Made Duke (only mentioned by Barks) that we now know to be the Duke Richard Quackett ancestor of Lord John Quackett alias Fantomallard. 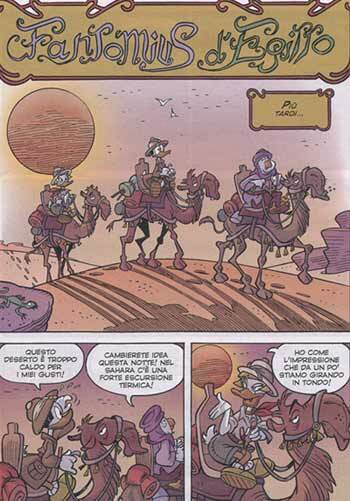 From this story we know then that the Mad Duke arrived in New Albion (modern Duckburg) with the crew of Francis Drake (shown in some Adventures of Don Rosa as the first European to set foot in the area). The Duke Richard Quackett after aving stollen part of the treasure of famous pirate remain with the settlers other in the area acquiring land and build several castles including his famous Castle of the Mad Duke. In this story is also shown the criminal Howard Drake heir of the corsair Sir Francis Drake, and it is also finally revealed the true identity of the mysterious Supreme Guardian who is Cartesius Gearloose twin of Copernicus. 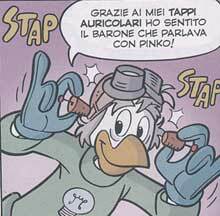 Cartesius was probably a friend or student/assistant of Spokius Spektrus having his secret laboratory in the basement of the Castle of the Three Towers created by Guido Martina in one of the first stories of Duck Avenger. 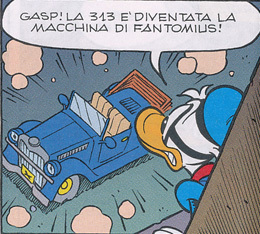 The cover of the TOPOLINO n. 3139 is dedicated to the fourteenth episode of the Fantomallard saga THE AMAZING VENTURES OF FANTOMALLARD - GENTLEMAN BURGLAR-. This cover made by Marco Gervasio shows Fantomallard with the portrait of his ancestor the Mad Duke. 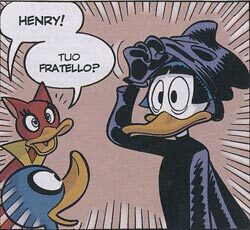 Marco Gervasio in the fifteenth episode of the saga dedicated to the gentleman THE AMAZING VENTURES OF FANTOMALLARD - GENTLEMAN BURGLAR- titled FANTOMALLARD OF EGYPT, published on TOPOLINO n. 3142 provides us with additional elements on the character of Henry Quackett brother of John. In fact, the story begins with a flash-back in 1916, when the architect Henry Quackett departed for a study tour mysteriously disappears. In the 1922 during a trip in Egypt Lord Quackett and his girlfriend Dolly Duck accidentally foud the brother of John in the Sahara Desert to the ancient people of Atlantis. This people lived with their Queen Altinea hidden from civilization in a huge and still gorgeous underground palace. Henry felt in love with the Queen after having help his brother and Dolly to escape from Atalntis decided (so far) to remain in Atlantis. The story is a clear tribute to the famous italian movie of Mario Mattioli Totò Sheikh (1950). 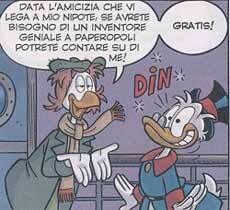 The end of the story gives us the cue for the next episode: as a surprise and in secret Scrooge McDuck, worried about the presence of Fantomallard returns to Duckburg commissioning to Copernicus Gearloose, the father of his friend Ratchet Gearloose, the alarm systems for his money bin ... ignoring not only that the inventor is also the friend and partner of the gentleman thief but that he also has a disreputable twin brother. And in fact it seems that Scrooge was wrong to identify the real Copernicus! 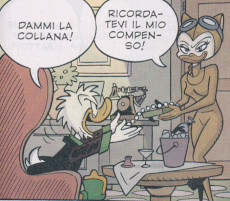 In the sixteenth episode of the saga dedicated to the gentleman thief THE AMAZING VENTURES OF FANTOMALLARD - GENTLEMAN BURGLAR titled THE THIEF AND THE BILIONARE, published on TOPOLINO n. 3145 Marco Gervasio show Fantomallard and his friends Dolly Paprika and Copernicus Gearloose against Scrooge Mc Duck temporarly back to Duckburg. 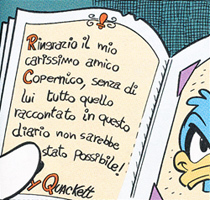 The famous bilionare is tricky by the perfidus Cartesius Gearloose, who pretending to be his twin brother Copernicus father of Ratchet, thus friend of Scrooge, convince the rich duck to install inside his money building some new security systems created by him. But the real scope of the criminal Cartesius is to steal the precious candy striped rubin and to get reveng against his twin brother Copernicus and Fantomallard. 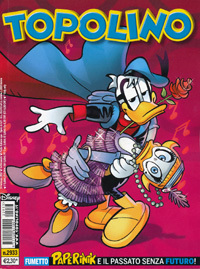 In this adventure several references to past stories are made, both from Gervasio and from Barks (candy striped rubin), Martina (hypnotic lamp, and the robery of the Scrooge matress, Castle of the three Towers), as well as Don Rosa (Ratchet Geraloose, Titanic cruise, money bin hold by the Scrooge's sisters, final return of Scrooge to Duckburg in the 1930). 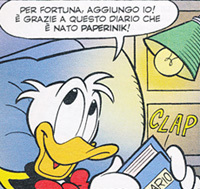 Amongs the famous reference to the story of Guido Martina the one related to the oring of Duck Avenger is the intent of Fantomallard, both declared to Scrooge both transferred to the heirs by meand of the famous diary, to steal the matress of Scrooge while he is sleeping on it! The seventeenth episode (in two parts) of the series dedicated to the gentleman thief THE AMAZING VENTURES OF FANTOMALLARD - GENTLEMAN BURGLAR titled DOLLY PAPRIKA, published in the TOPOLINO n. 3194 shows us the firts moments of the relationship between Lord Quackett and Dolly Duck starting with their very first fleeting encounter in 1913 during one of the many boring costume parties. The story then takes up in 1920 when Lord Quackett in the outfit of Fantomallard meets again Dolly during a robbery at the Countess De Snob's house, expanding what already mentioned by Gervasio in his history DUCK AVENGER AND THE PAST WITHOUT FUTURE. Interesting the Dolly Paprika red, with fox ears, costume which takes its cue from the Red Fox jewel belonged to Lucrezia an eccentric friends of Dolly. 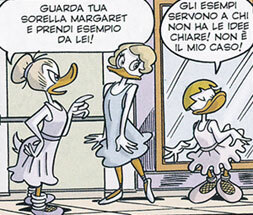 In the story both the mother and the sister of Dolly Duck are also shown, they manage a dance school. Very Interesting the references to Richard Quackett alias Mad Duke to Sir Francis Drake to the Junior Woodchucks as well as to the birth in 1920 of Donald Duck and his twin sister Della of which a paragraph in a newspaper reports the announcement by their mother Hortense McDuck sister of Scrooge. As a presentation of both the parts of the story the publisher proposes two interesting introductions dedicated to the St. Valentine day. Because of the St. Valentine day the story in two parts is introduced by two interesting articles. 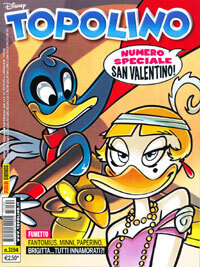 dedicated to the seventeenth episode of series THE AMAZING VENTURES OF FANTOMALLARD - GENTLEMAN BURGLAR the cover of the TOPOLINO n. 3194 shows a beautiful drawing by Marco Gervasio, dedicated to Fantomallard and Dolly Paprika as well as to the St. Valentine day. 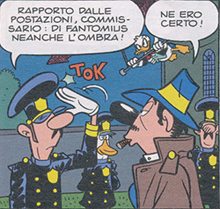 The eighteen episode of the saga dedicated to the gentleman thief THE AMAZING VENTURES OF FANTOMALLARD - GENTLEMAN BURGLAR titled NOTRE DUCK, published in Italy on the comic TOPOLINO n. 3210 reveals us the mysterious identity of the famous Phantom of Notre Duck, character who appears in a famous story of Carl Barks. Marco Gervasio reveals us as Henry Quackett, John Quackett's brother, because a natural disaster had to leave the city Of Atlantis under the Sahara desert in which he was refuge years before. Having himself designed and built the Notre Duck cathedral, he decided to disguise himself and wearing a black outfit he start to commit several thefts to help the Atlantis peoples to rebuild their destroyed city. The only coins Henry hold for himselfs serve for his personal hobby project to made "monetary" scale model of Notre Duck. Interesting is The origin of the black costume of the Phantom that was used in 1700 in Paris by a royal tax collector relative of John and Henry's mother. He worn the black costume scare the debtors when collecting taxes. At the end of the story a partial image of a Scrooge mask brings us back to the moment when the Phantom in the Barks story reveals his face that appears to be identical to the Scrooge one. 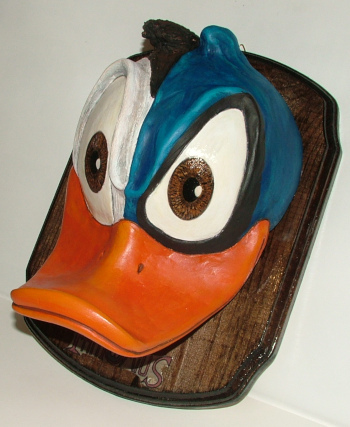 It can therefore be assumed that Henry Quackett had worn this mask to stoll the coins from 's Money Bin or that in old age his appearance became similar to that of the richest magnate of Duckburg. Also interestingly are the many sequences of the story that are closelly relate to Barks adventure and the initially tribute to the three boys who are protagonists of Stranger Things. This story is also followed by a brief article with an interview to Marco Gervasio. 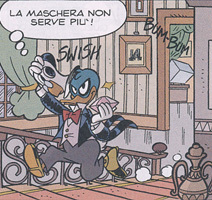 The nineteenth episode of the saga dedicated to the gentleman thief THE AMAZING VENTURES OF FANTOMALLARD - GENTLEMAN BURGLAR titled WITHOUT MASK, published on TOPOLINO n. 3225 shows us a Lord Quackett in action at the resort of Ocalulu in the Sandwich Islands about four hours of sailing from Duckburg. In this adventure Lord Quackett acts during the day practically without his usual black costume (apart from some sequences in which the thief gentleman is disguised by Fantomallard but using a commercial costume) and uses instead several disguises including a very curious sailor one very similar to the Donal Duck outfit. This story the detective Pinko is back again who, as always, is masterfully cheated by the smart thief. 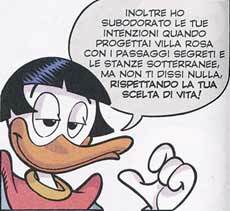 Dolly Paprika instead, remaining in Duckburg, and she is practically not involved in the actions except at the beginning where in Villa Rose she talk with the wife of Pinko pretending that Lord Quackett is in bed influenced. She also appeared and at the end of the story when near the coast of Duckburg she retrieves his boyfriend with a special steam jet water-scooter. The twentieth episode of the saga dedicated to the gentleman thief THE AMAZING VENTURES OF FANTOMALLARD - GENTLEMAN BURGLAR titled THE CHALLENGE OF FANTOMALLARD, published on the TOPOLINO n. 3237 shows us a Lord Quackett and Dolly Duck engaged in a challenge against the most world famous detectives: Paper Holmes and his assistant Duckson , Hercule Paperot, Chick Paper with his two assistants Rob and Bob, the famous writer Jane Purple and of course the unmissable detective Pinko legendary enemy of Fantomallard. 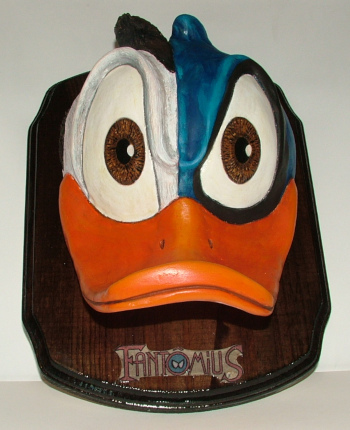 This adventure takes place at the wax museum of Duckburg managed at that time by dr. Ecks who is one of the three crazy scientists invented by Gottfredson (Professors Ecks, Doublex, triplex whom years later they will perform disturbing experiments of forced hypnosis in a manor near Mousetown. 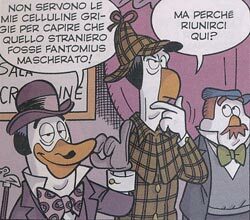 Together the already known Holmes, Paperot and Pinko Gervasio also shows us the detective Chick Paper with his two assistants Rob and Bob from New York. 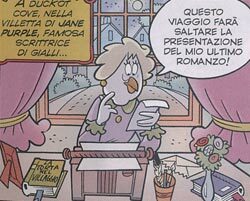 These are based from the Italian comics chracters Nick Carter and his assistants Patsy and Ten, the novelist writer Jane Purple who is inspired by Jessica Fletcher of the TV serie (Murder, she Wrote). There are also numerous tributes by the author to several Disney authors showing in the museum the wax statues of many little known characters: in addition to the above mentioned Dr. Ecks we find the The Bat, Eli Squick, and the Pirate Orango by Gottfredson; Grandpa Beagle of Barks and Don Rosa; a half-bust statue of Cornelius Coot , and some Gervasio characters shown in previous adventures of Fantomallard including Fu Man Etci�/b>, Lady Mustard, and the actors Douglas Fairbarks, Fred Duckster and Gloria Squackson as well as the gorilla Gong. Dedicated to the twentieth episode of the saga THE AMAZING VENTURES OF FANTOMALLARD - GENTLEMAN BURGLAR the TOPOLINO n. 3237 the cover by Marco Gervasio, shows an awesome Fantomallard. In the twenty-first adventure of the saga dedicated to the gentleman thief THE AMAZING VENTURES OF FANTOMALLARD - GENTLEMAN BURGLAR- titled THE NIGHT OF THE GEMS , published on the TOPOLINO n.3273 Lord Quackett is engaged in several night missions to try to steal some precious gems from several rich nobles of Duckburg, including the apparently clumsy Count Abbondazio Contini boyfriend of Lucrezia friend of Dolly Duck. Strangely enough, anytime Fantomallard try to steal the gems these have been already stolen by someone else, and Fantomallard only gets to be blamed for all thefts. With clever intuition the gentleman thief realizes that the Count Contini and the other riches had staged the thefts of the gems to collect the insurance money as well as to sell the gems with a lowe prise to a mysterious foreign buyer. The money obtained would be used by the noble to pay the debts caused by a bankrupt investment in the shares of the company PETROL OIL. 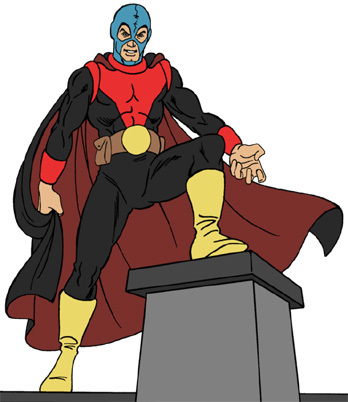 Discovered the trick Fantomallard with a mask pretends to be emissary of the foreign buyer and takes possession of the gems, thus wiping the small group of rich villains who for fear of being under the vengeance of Fantomallard prefer to get arrested and go in prison. 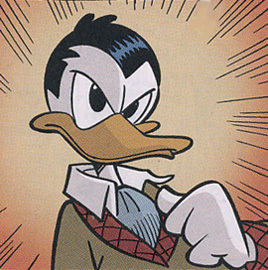 Interesting the final twist in which it turns out that the rich stranger is none other than the South African Flintheart Glomgold treacherous adversary of Scrooge Mc Duck and now also decided to take revenge on the gentleman thief. 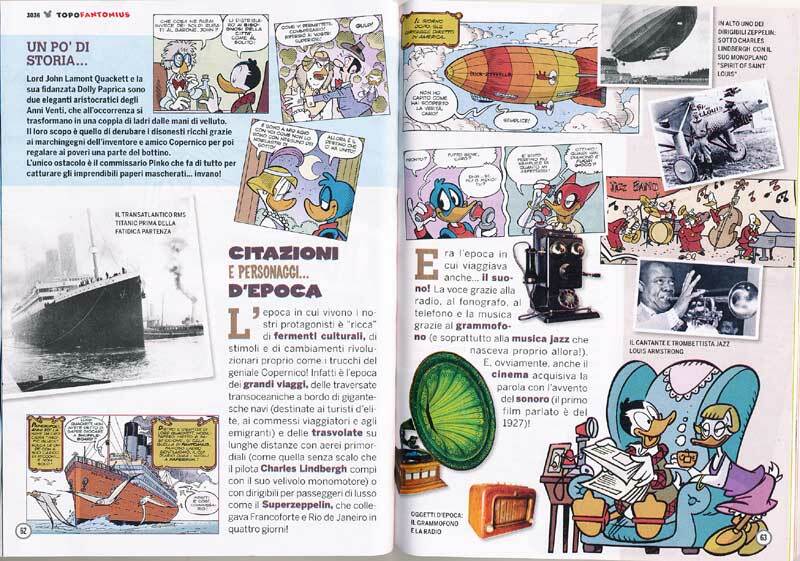 In this adventure set in 1925 Marco Gervasio introduces as usual different references to stories and places typical of Duckburg including the lighthouse of Capo Quack and just the appearance in the last cartoon of Flintheart Glomgold. Very nice and welcome the homage that the author makes to the manager of this site when Fantomallard manages to escape in pursuit of Pinko using a secret opening along a wall in SALIMBETI STREET! Dedicated to the twenty-first episode of the saga THE AMAZING VENTURES OF FANTOMALLARD - GENTLEMAN BURGLAR the TOPOLINO n. 3273 has a beautiful cover always by Marco Gervasio, with Fantomallard. The twenty-second episode (in two parts) of the saga dedicated to the gentleman thief THE AMAZING VENTURES OF FANTOMALLARD - GENTLEMAN BURGLAR titled THE TWO AVENGERS, published on TOPOLINO n .3275 shows us Lord Quackett struggling with an amazing time adventure in which the gentleman thief is forced to go in the future (using a pocket watch of the time invented by Copernicus) right at the time of Duck Avengers his heir. 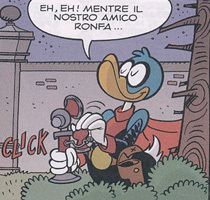 Fantomallard in fact must find and save Dolly Paprika which in turn has traveled in the future by inadvertently operating the cuccu clock other contraption invented by Copernico Gearloose and already used by Duck Avenger to return to the future when in story DUCK AVENGER AND THE PAST WITHOUT THE FUTURE he goes precisely at the time of Fantomallard in 1920. Dolly Paprika was in fact kidnapped by a mysterious criminal who asks for his release the famous golden nugget "duck egg" in possession of Scrooge. 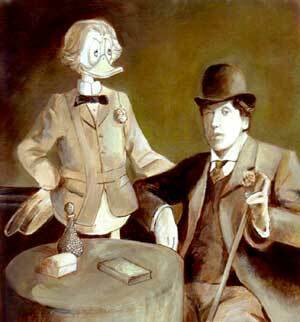 Once in the future the gentleman thief, thanks to a diary that Duck Avenger has left in the basement of the Villa Rose ruins, discovers the true identity of his heir and decides to ask for help to Donald Duck to "borrow" the Scrooge's nugget and save Dolly Duck. After going to Gyro Gearloose great-grandson of Copernicus the three go to the emergency shelter in a cave near Villa Rose where Fantomallard kept his larger special machinery. 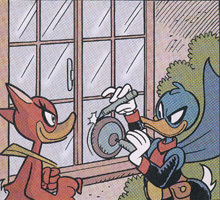 Restoring a special drill rover Fantomallard and Duck Avenger penetrate the Scrooge's Money Bin where they are captured by the efficient protection system of the nugget. After the arrival of Scrooge the two manage to persuade him to lend the nugget guaranteeing the return. The delivery of the nugget takes place at the disquieting black island off the Bay of Duckburg (already shown in the story DUCK AVENGER AND THE ISLAND OF THE MONSTERS) where Fantomallard discovers that the mysterious kidnapper is the criminal billionaire Flintheart Glomgold who happened to have seen Dolly Duck appeared in his time and because when he was young he discovered her secret identity he decides to kidnap her to get revenge both of Fantomallard and Scrooge. After several adventures, both the gentleman thief and his partner, with the help of Duck Avenger, manage to escape from the island and cheat the perfidious South African tycoon. Before returning to their time, however, the two thieves wisely decide to forget this adventure in the future by taking a dose of Coco Nonos provided by Duck Avenger. 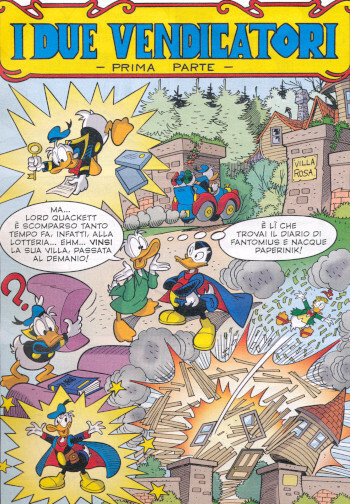 In this story Gervasio inserts many references to old stories including the first adventure of Duck Avenger, the saga of Don Rosa in which Scrooge because of the nugget decides to move away from Glittering Goldie and the two above-mentioned stories of Duck Avenger. 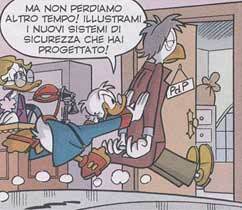 Interesting the emergency shelter already shown by Michelini and Scarpa in the history DUCK AVENGER AND THE RETURN TO VILLA ROSE and the nice tribute to some classics of time travel Doctor Who, The Time Machine and Back to the Future when Flintheart Glomgold talks about its scientists working on time travel experiments. 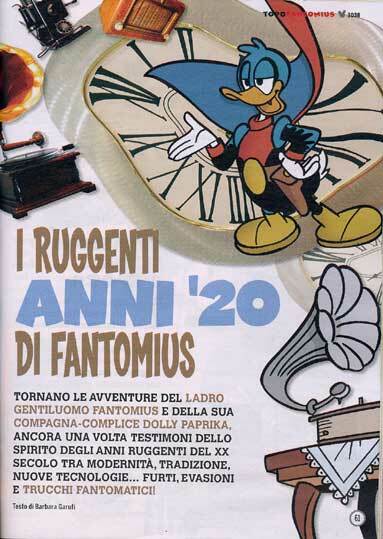 Dedicata to the twenty-second episode of the saga THE AMAZING VENTURES OF FANTOMALLARD - GENTLEMAN BURGLAR the TOPOLINO n. 3275 shows an interesting cover by Marco Gervasio with Fantomallard and Duck Avenger. 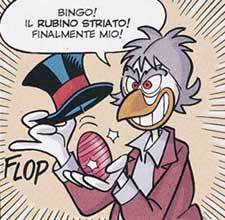 The 23rd episode of the saga dedicated to Fantomallard THE AMAZING VENTURES OF FANTOMALLARD - GENTLEMAN BURGLAR titled THE SEVENTH ART, published on italian Disney comic TOPOLINO n. 3280 shows the return of some characters and villains appeared in some previously episodes. 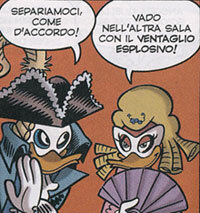 The two movie actors Gloria Squackson and Ducklas Fairbarks, who they also acted in a movie as Fantomallard and Dolly Paprika, Jen Yu alias Lady Mustard the skilled female-thief who was the former girlfriend of Fantomallard and Flintheart Glomgold the evil south african tycoon already seen in the two last previously episode of the saga. The story focuses on the attempt of Flintheart Glomgold, in complicity with Lady Mustard, to steal a precious pearl necklace in the possession of Gloria Squackson. The attempt thanks to the ability and the disguises of Fantomallard and Dolly Paprika fails miserably leaving the two treacherous criminals only with a vulgar imitation of the real necklace. Interesting is the ending in which a strange phone call to Villa Rose portends a possible problematic situation of Coperninus Gearloose and therefore a sequel directly connected with this adventure. 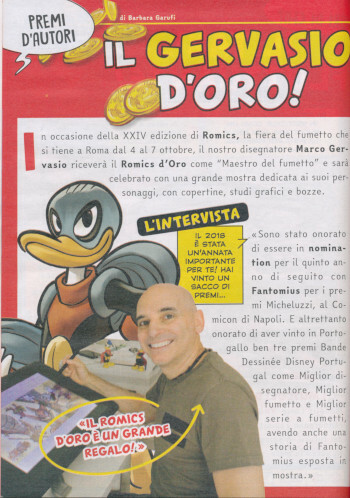 During the twentyforth edition of ROMICS, the comics convenction in Rome from the 4th to the 7th of October the 2018, the artist and writer Marco Gervasio, who create the Fantomallard saga, is awared with the Gold Romics as "Master of the comic". 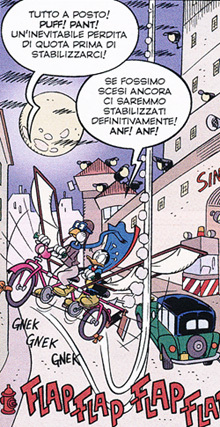 Duck Avenger pretends to be the ghost of Fantomallard in the story of Salati and Mazzon PAPERINIK E L'ALTRO PAPERINO (DUCK AVENGER AND THE OTHER DONALD). 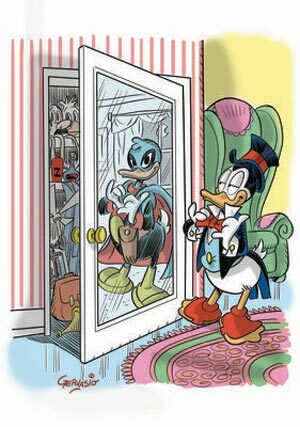 In this strange adventure Duck Avenger is transferred by a inter-dimensional gate in an alternative reality where Donald after having inherit all the money of Uncle Sgrooge, dediced to not wear anymore the costume of Duck Avenger. 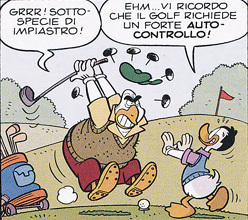 In the story of Mazzoleni and Asaro PAPERINIK E IL RITORNO DI LÈBRICCONS (DUCK AVENGER AND THE RETURN OF LÈBRICCONS) a minor and not very smart challenger of is introduced. His name was Arsenio Lèbriccons and he also during the 20s tried to made some robbery in a vain attempt to rival the gentleman thief and to impress Dolly Paprika . Also in this story Duck Avenger takes on the role of Fantomallard to unmask an heir of Arsenio Lèbriccons named Lucas- a cameraman of the Duck News-. This new Lèbriccons made several robbery which had been previously failed by his ancestor during the 20s with the purpose of bringing to the nowday pubblic the name of Arsenio Lèbriccons. 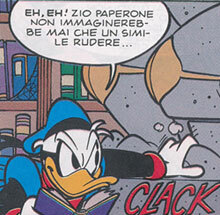 Both Gladstone and Donald are wearing the costume of Fantomallard in the story of Mazzoleni and De Lorenzi PAPERINIK COLPISCE ANCORA (DUCK AVENGER STRIKES AGAIN. In this adventure is also shown for the first time the Dismal Valley Manor one of the secret hideout of Fantomallard. Being an old fake-medieval castle we can image that it was laso made by the famous Mad Duke (Duke Richard Quackett) ancestor of Lord John Quackett. 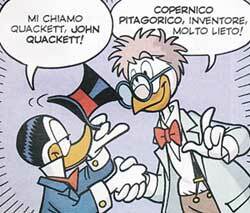 Lord Quackett and Dolly Duck are also shown by Bruno Enna and Paolo De Lorenzi in the second episode of the story THE GREAT RACE titled THE PAST. In this adventure In fact, some well known characters of Duckburg are involved by a strange elf named Gin in a car race through the time in order to find the place where has been hidden the stollen first dime Scrooge. 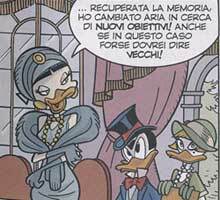 Returning to late 20's, thus at the time of the gentleman thief, Donald and Daisy go to Villa Rose where they meet the true Fantomallard and Dolly Paprika. In this story Fantomallard also meet the maniac Mad Ducktor alter ego split of Gyro Gearloose also him involved in the temporal car race. 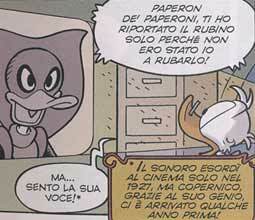 Besides the reference to the saga of Fantomallard by Marco Gervasio, Bruno Enna e Paolo De Lorenzi also introduced in the story several references coming from some stories by Don Rosa as for instance the Money Bin in Duckburg already in the 1929 and the fact that Scrooge was not present in Duckburg in that period. A very beautiful sculpture of Lord Quackett is created by the talented artist Giulio Golinelli. 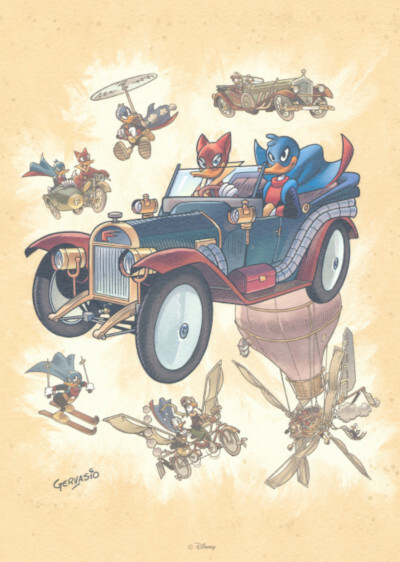 This awesome representation is part of the private collection of the Disney artist and writer Marco Gervasio who is the creator of the adventures of Fantomallard and Dolly Paprika. Fabrizio Milovich made this beautiful cover Definitive Collection style dedicated to Fantomallard and Dolly Paprika. Marco Gervasio made this awesome drawing with Lord Quackett and Fantomallard for a Greek Fanzine. 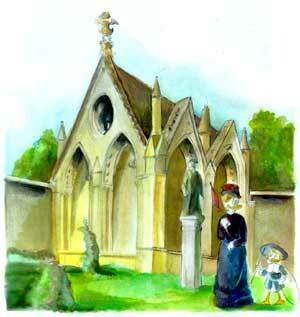 In this nice acrylic painting, the Italian artist Andrea Cipolla hypothesizes a very young Lord Quackett together with his mother walking near the family mausoleum in England at the end of the 1800s. In this interesting painting the same Andrea Cipolla shows a teenage Lord Quackett photographed together with the Irish author Oscar Wilde, a scene which could takes place in Cannes in 1899. A very beautiful representation of Fantomallard and Dolly Paprika in a possible human variant in the style of some comics noir character of the 60s has been created by the brillant artist FaGian. From the website of FaGian are also these awesome drawings with Fantomallard and Dolly Paprika with the armchair in Villa Rose and compared to other famous thiefs of the italian comics; Diabolik and Eva Kant. This drawing shows the gentleman thief Fantomallard and his girlfriend Dolly Paprika during one of their bold robbery actions, carried out in a suggestive full moon night in Duckburg's downtown during the early 1900s. On this drawing was chosen to represent the "killmotors" hill with the remains of Fort Duckburg then in accordance with the stories of Carl Barks according to which the famous Money Bin on the Duckburg hill was built by Scrooge only in the 50s. 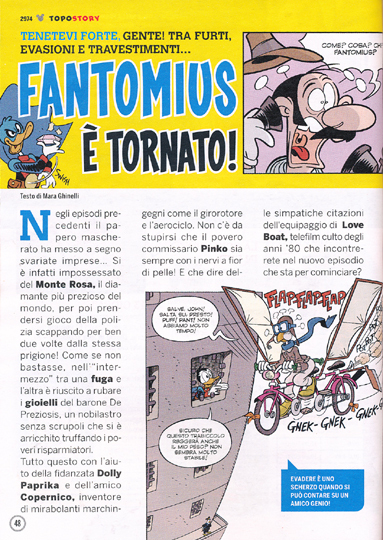 Even if it has nothing to do with the real Fantomallard, there is a strange curiosity in Martina's story LA RISPOSTA DI PAPERINIK (DUCK AVENGER's ANSWER) published in the Italian comic PAPERINO MESE n� 138 December 1991, where Duck Avenger is helped in one of his missions by a strange small robot built by Gyro. This mechanical man "who looks like Frankenstein", wore a Duck Avenger-like costume with the letter F on the chest. And he is called Fantomallard by his creator. 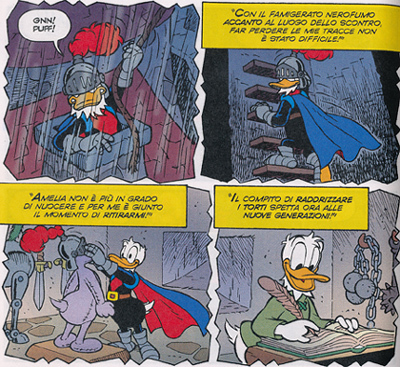 An Historical parody of Fantomallard and Duck Avenger it is shown by Gabriele Panini e Alessandro Del Conte in the story PAPERINIK DEI TEMPI OSCURI- IL RITORNO DEL CAVALIERE VENDICATORE TOP. 2280 (DUCK AVENGER OF THEDARK AGE- THE RETURN OF THE AVENGER KNIGHT. 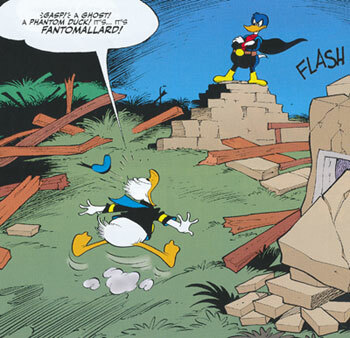 In this parody, placed around the 1000 AD in the Britain county of Duckshire, a misterious Avenger Knight wearing a costume similar to the one of Fantomallard was fighting against the malefic Magica the which. Like Fantomallard also the Avenger Knight has an hide secret hideout, he use special devices and he wrote his memoirs on a diary. 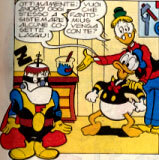 Of course also in this case the secret hideout, the diary and the costume of the Avenger Knight were found many years later by Donaldin whom decided to imitate the deeds of the Avenger Knight fighting against the Magica the which also with the help of his friend and inventor Gyrus. 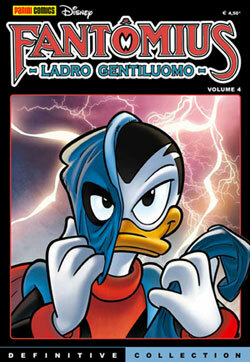 A modern version (PK style) of Fantomallard is shown in the Danish story THE LEGACY published in 2005. In this adventure, after several years of isolation in an oriental monastery where he went through martial arts training, the gentleman thief comes back to Duckburg as an old master to know and train the mysterious Duck Avenger who has become his heir. Two short flashback of this "Macrocephalus" variant of Fantomallard are shown in the Danish story SOUND AND FURY and MISTAKEN IDENTITY. Another Flashback of this Fantomallard is shown again in another Danish story titled HOT CHEMISTRY. 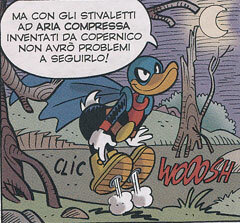 In this strange adventure Duck Avenger remind his previous encounter with Fantomallard. A memory album or one of the gentleman thief's diary with an old photo of Fantomallard it is also shown. In this story an alternative and too much politically correct version of Fantomallard; is given. He was basically a second "Robin Hood" who robbed from the rich to give to the poor. Very interesting in this adventure is the mysterious character of Ireyon who despite her young aspect seems to have been a helper of Fantomallard during the years of his activity. 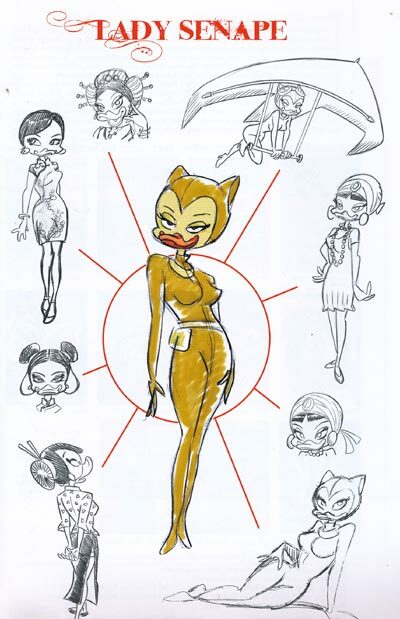 The images of Ireyon (she looks like a fox ) is present in one of the photos found by Donald in Villa Rose. 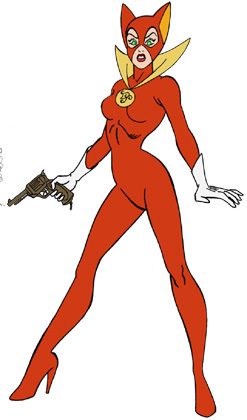 It is not clear who this character really is, maybe another friend of Fantomallard or she could be and alternative variant of Dolly Paprika or Lady Mustard created by the Danish writer. And why she is still so young despite she was acting many years ago with Fantomallard? 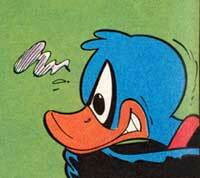 This doubful is still in the mind of Duck Avenger at the end of the story. The Ireyon mistery is revealed in another Danish story titled ONCE UPON A TIME...URGH!. Duck Avenger, in this strange story placed between the past and the present, discovers that Ireyons was born 5000 years ago in an Assyrian-Babilonian style civilization. Her immortality coming from a magic jade statuette in the shape of a young wolf. This stauette was stollen by Ireyons to the powerful king and sorcerer of the ancient city of Urgh. The statuette was broken in three pieces used or sold by Ireyons during her long immortal life. The body of the jade statuette was found by Fantomallard when Ireyon was his partner. This part was later found, together other elements, by Donald in Villa Rose. 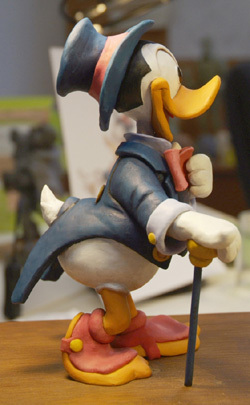 The stauette's head was placed in the Duckburg's museum. The tail of the statuete was instead keeped by Ireyon as an amulet. After several adventures and time trips between the past and the present the two masked "heroes" put together the statuette elements and defeat (in the past) the terrible king sorcerer. In this story Ireyon detectes the true identity of Duck Avenger and she thus becomes his partner as she already was in the past helper of Fantomallard. Another flash-back of the "macrocephalus" version of Fantomallard it is shown again in the Danish story DER PECHONATOR published in Geramny in the comic pocket Lustiges Taschenbuch n. 511. 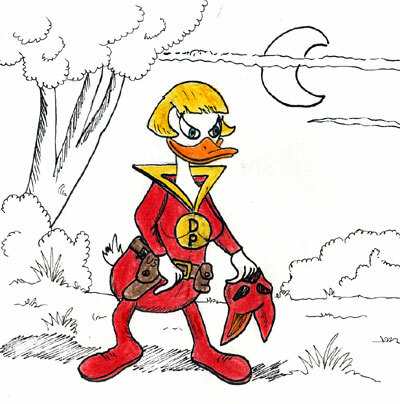 In this adventure the scenario and the Donald Duck alter ego are a mix between the classical and futuristic variant (PK) of Duck Avenger. 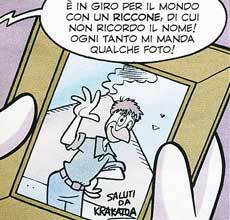 Copyright Produzione Da. Ma. 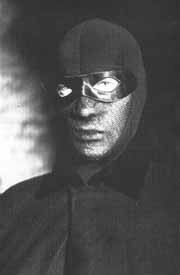 Srl Because of his name and his dark mask who hid his true identity, the character of Fantomallard takes reference from the smart criminal Fantomas created in 1911 by the French writers Pierre Souvestre and Marcel Allain. 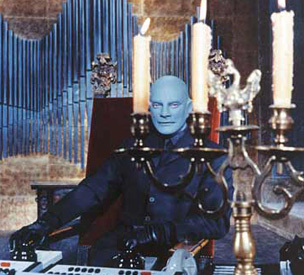 After a long series of novelles and mute films, realized from 1911 to 1930, Fantomas came back into the European public eye during the middle 60s because of a funny movie trilogy well acted by the unforgettable actor Louis De Funés who played the police inspector Juvé, tireless enemy of Fantomas. Furthermore an interesting but less known TV series in four episodies, has been realized in 1979/1980 by a French-German co-production. 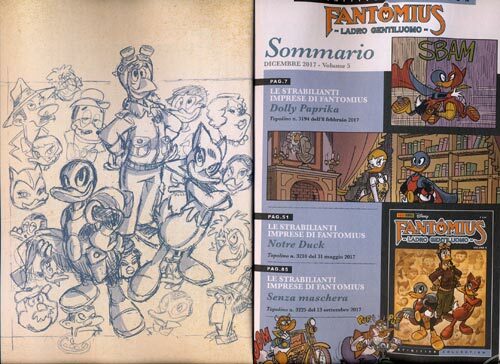 An interesting comparison between Fantomas and Fantomallard was drawn by Dario Brugnone of Genova Italy. Taking reference from the cover of the first Fantomas novel of 1911, he created this fascinating drawing, showing a hypothetical Fantomallard adventure located in the city of Duckburg in 1928 and properly titled "The terror of Duckburg". Fantomas is for sure an elusive thief, but is not much of a gentleman. The nobil side the personality of Villa Rose's owner Fantomallard comes from the gentleman thief par excellence Arsène Lupin, created by the French writer Maurice Leblanc in 1905, who came back into the public eye during the 70s because of a lucky TV serial elegantly acted by French actor, Georges Descrières.